The Swan family are off to a troubled start. 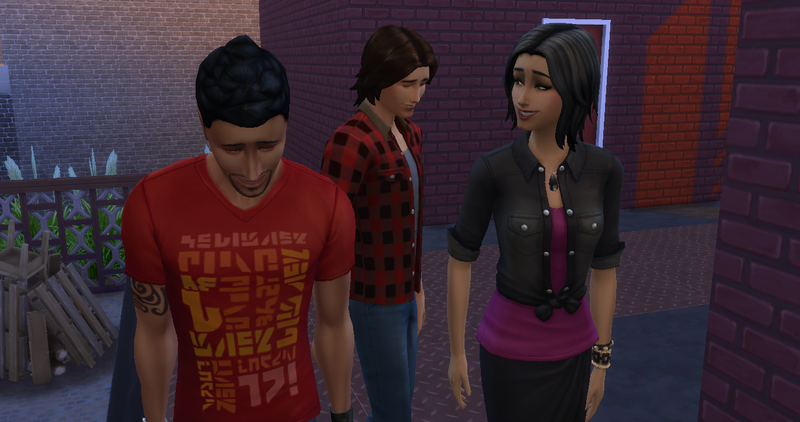 Their move to Newcrest was a bit hurried as they have had to flee their home town due to social and political unrest. Unfortunately, one member of their family was left behind, Sim had been arrested during a protest and was imprisoned indefinitely. 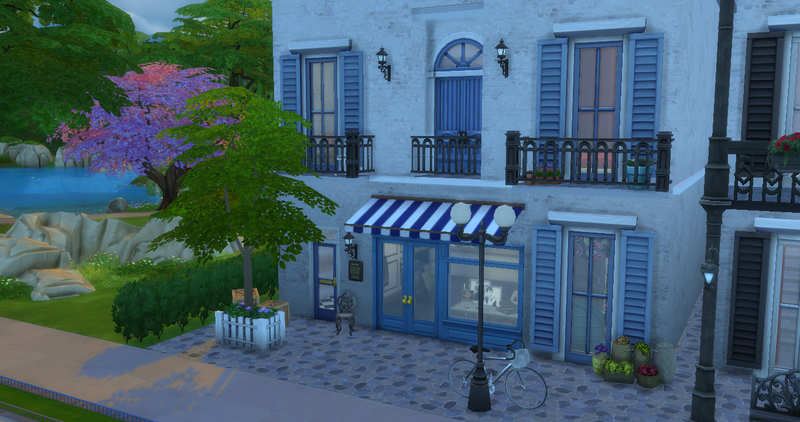 Just as things seemed at their bleakest, Pierre fled with his two aunts to Newcrest where they used what little savings they had to buy a small shop with a tiny apartment above. It was small, but it was safe. The whole family are artists! 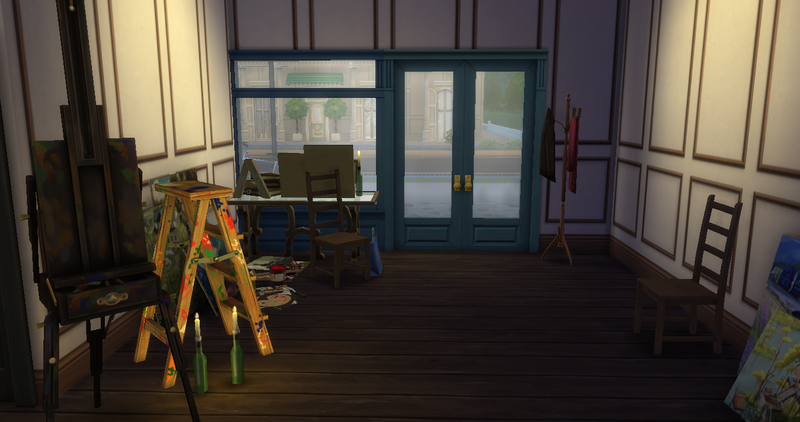 Amalie is a painter and Estelle has a fine arts degree, so they were pleased to find the small retail space was already set up as a gallery! 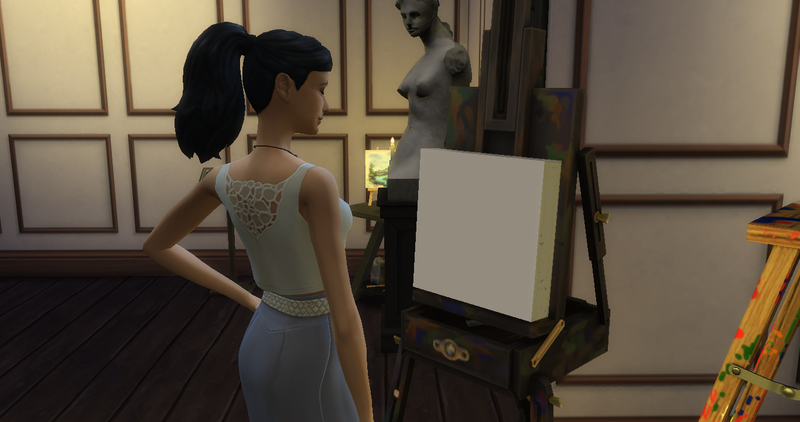 The plan was for Amalie to produce most of the paintings, and Estelle would run the business. When they arrived at their new home, Pierre was feeling guilty that he’d left his mother behind. ‘What could you do if you were there?’ Estelle rationalised, always the most pragmatic aunt. 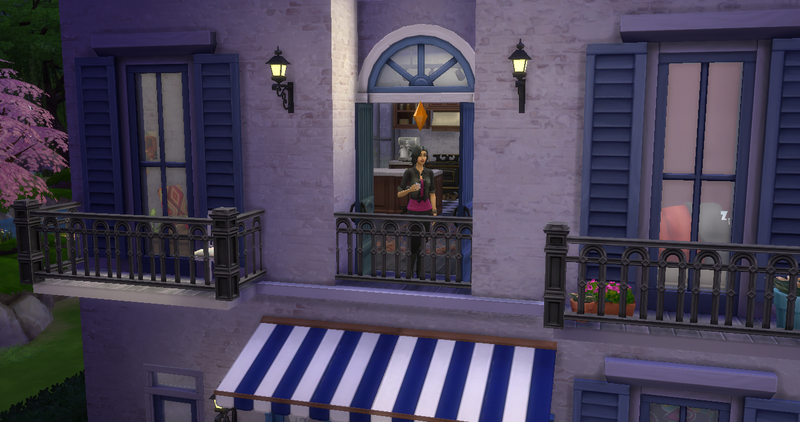 Estelle was keen to inspect the new premises. She knew if they didn’t make some money quickly they would soon run out! The previous owner had left some things behind, but it wasn’t much, there was little worth selling. She hurriedly ushered her sister to one of the old easels, and encouraged her nephew to attend to his studies. 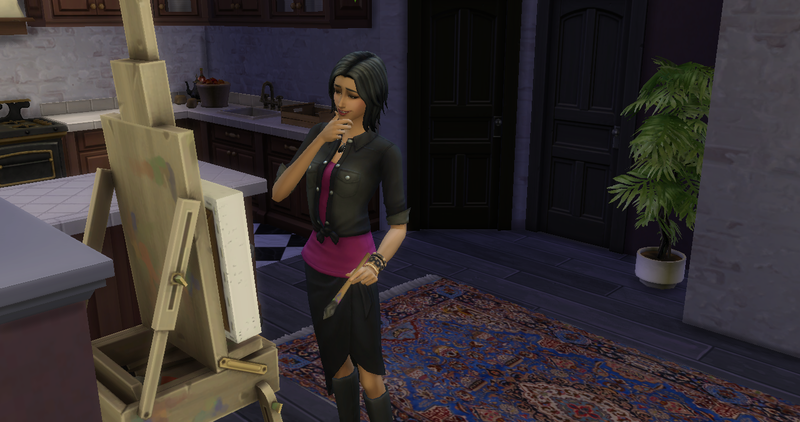 Then Estelle attempted to paint as well, although Amalie had always been the one with the talent. Hopefully she could produce something sellable. If not, Amalie could always paint over the canvas with something better. After Pierre finished his work he felt the need to escape into the fresh air outside. 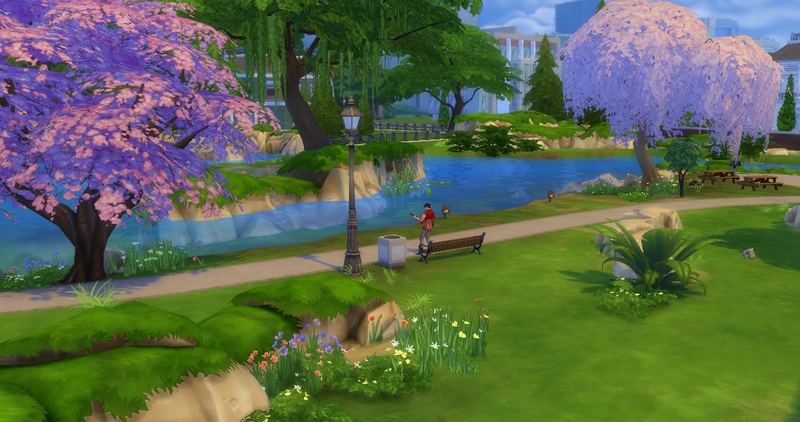 He took a stroll behind the shop and sat on a bench by the river. He felt so out of place in the bright sunshine, like he should be enjoying the beauty of the place, but in his heart he was somewhere else. His mind was still back home, in a damp cell, desperately clinging to his mother’s hand. But what could he do!? A million thoughts rushed through his mind, a million scenarios, none of which ended well. 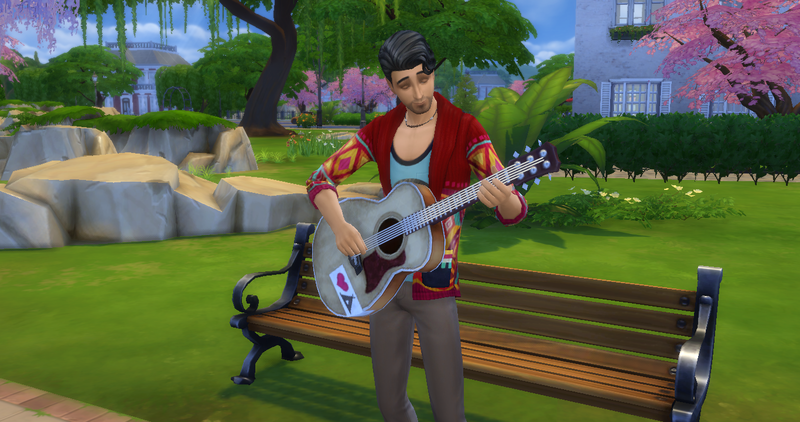 He’d brought his old guitar from home, he found it now, and began strumming a few sad notes. 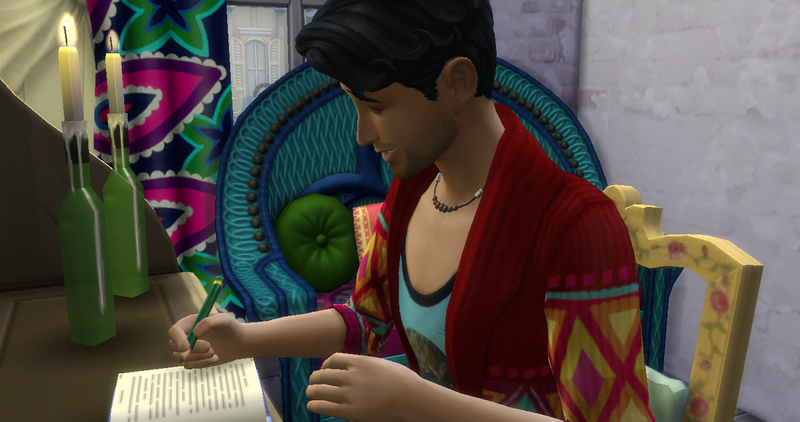 The humming chords seemed to echo something deep inside him and he let a few more throb out. Soon he was lost in the music. 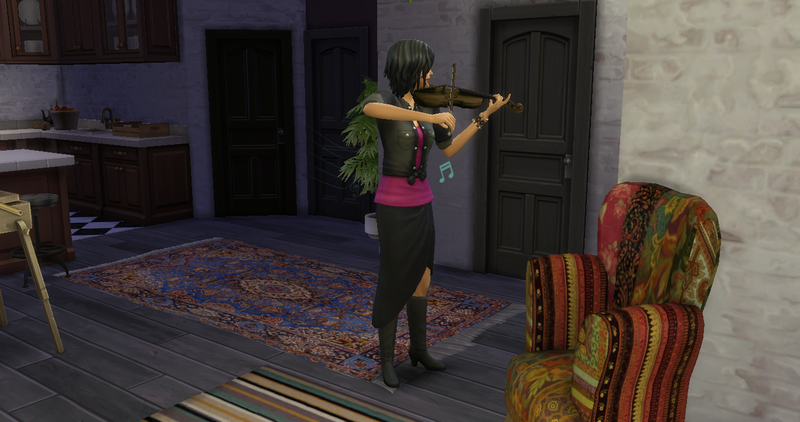 Estelle too found relief in music, but when she picked up her father’s old violin the keening noise was something more painful. In the shop below, Amalie couldn’t stand it. Not because the music was bad, but because, like Shostakovich, it expressed something too sad to bear. 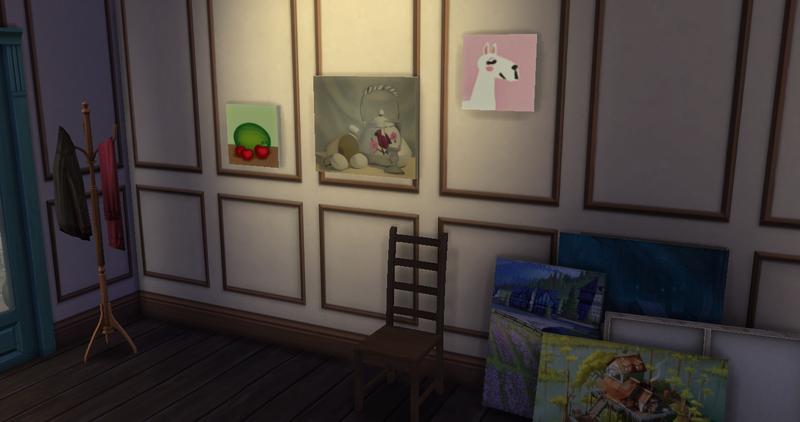 Several paintings now hung on the walls, they weren’t her best work but they would do for now. She washed the red paint from her hands and escaped outside. It struck her that they had nothing to eat, and so she busied herself with collecting from wild plants until the music stopped. Then she returned to cleverly replant some of the produce so they would have food in the future. 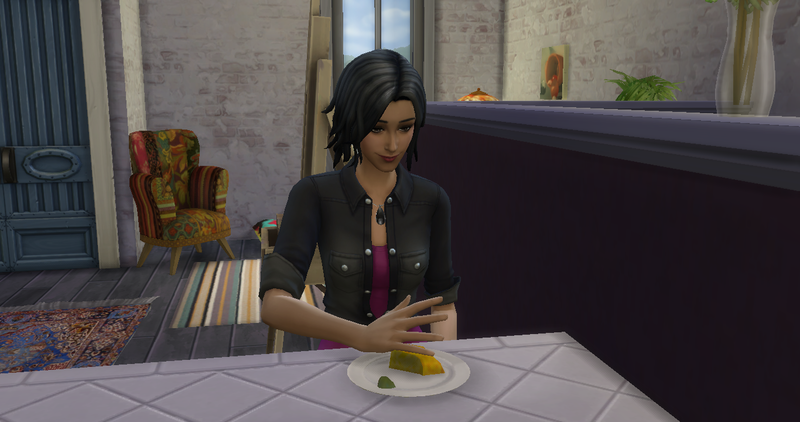 The only food they could rustle up that evening was cheese and olives but they enjoyed it as it was the first thing they’d ate since leaving their old home. Pierre and Amalie felt asleep easily that night, they were exhausted. But Estelle was too excited to sleep. 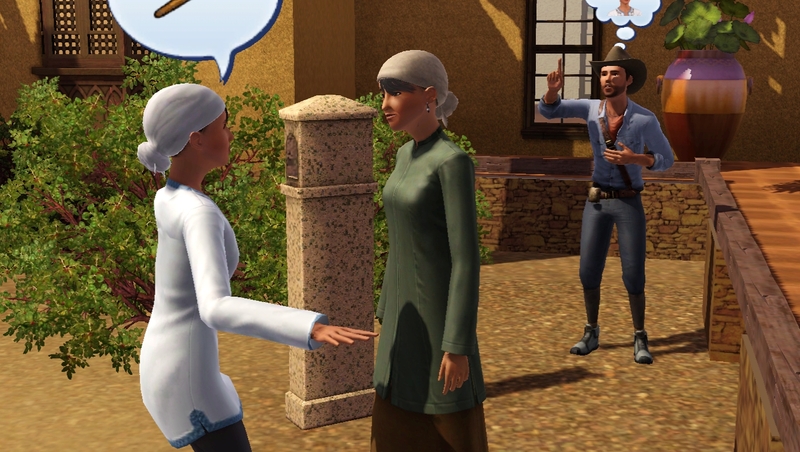 She was hopeful about their new life, and the possibilities it brought. 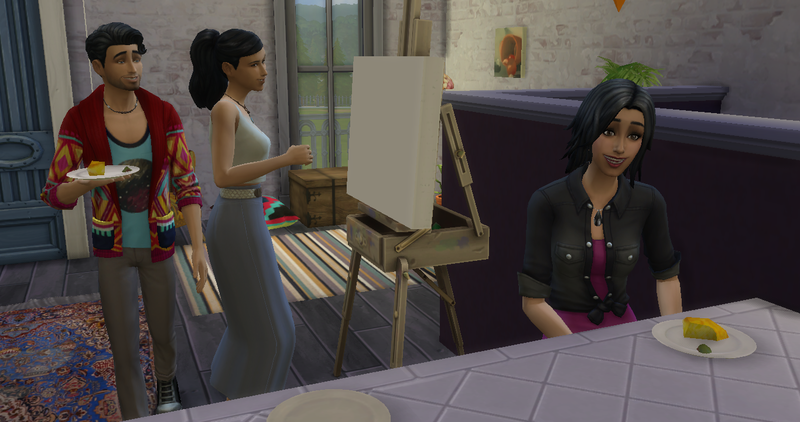 They planned to open the gallery the next day, and she wanted to get out and try and encourage people to attend. At least, this was the reason she told herself. 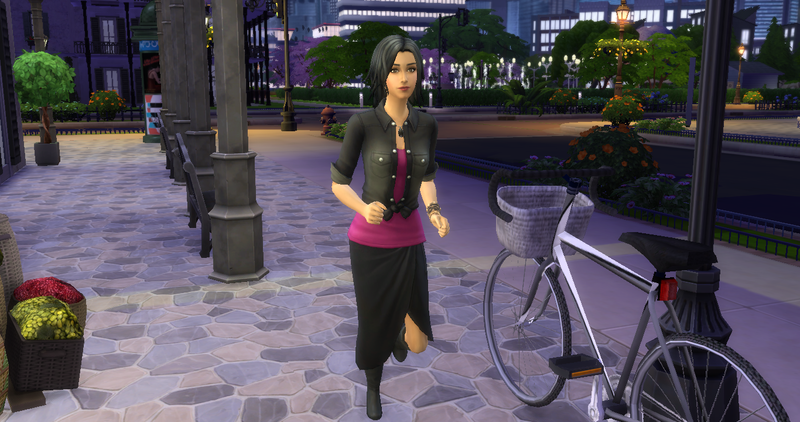 The real reason was that she was itching to explore the new town, to get out there and experience life again! Stealthily she slipped out of the house and over to the old part of town, where she found a club with music pumping out onto the street. She didn’t feel afraid. After what she’d experienced back home, she felt like there was nothing to fear here. 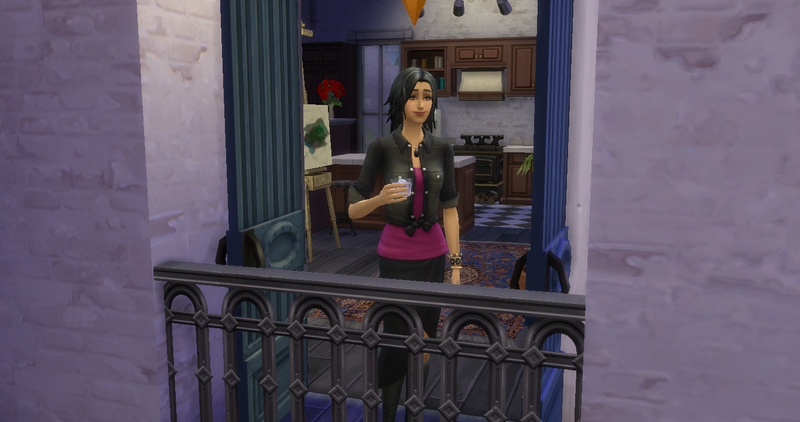 She chatted away to as many people as she could, inviting them to the gallery. 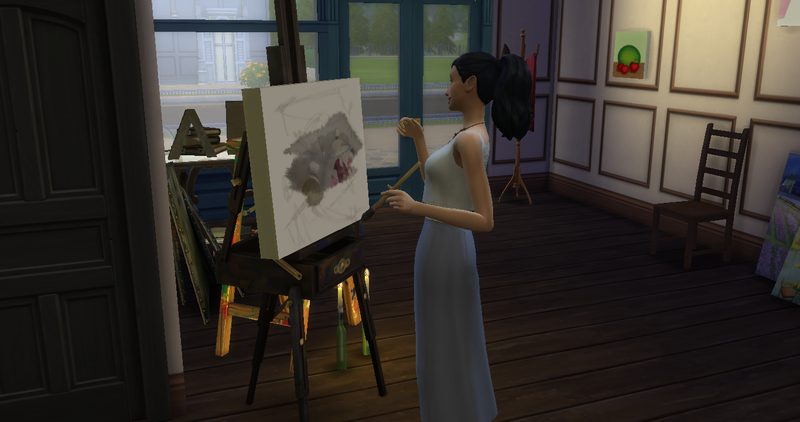 They didn’t seem too interested in art, and they probably weren’t her target customers, but she had fun anyway. 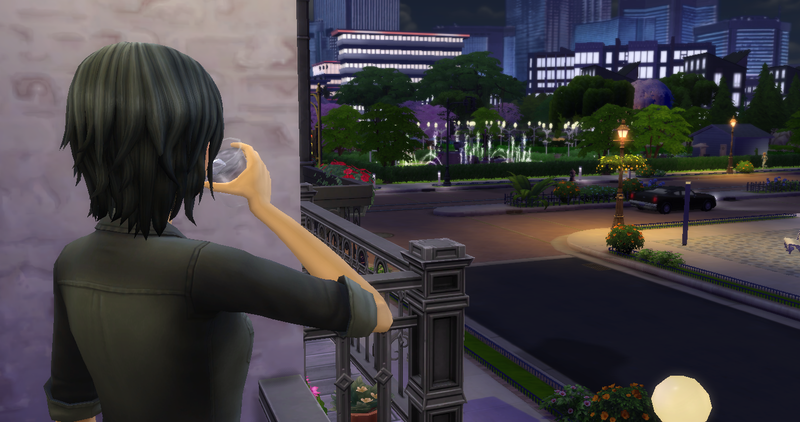 It was late when she got home, but Estelle took a few minutes to enjoy a drink on the balcony. She admired all the dazzling lights and felt confident they had made the right decision. Then she quietly slipped into the bed she shared with her sister. 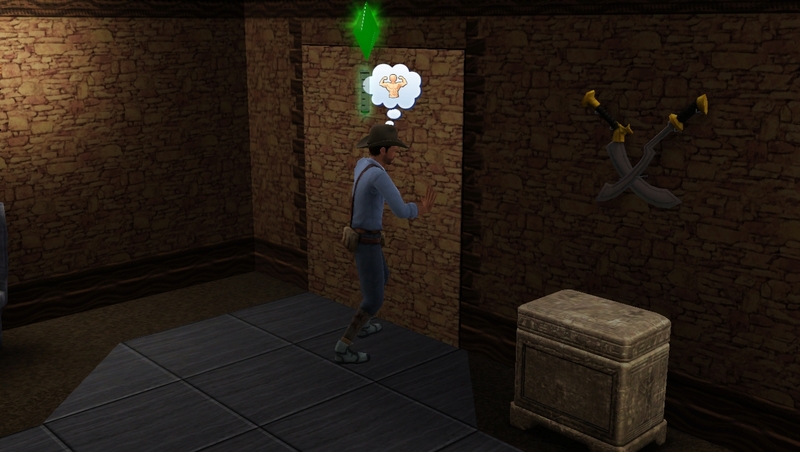 Indie approached the tomb cautiously, he felt strangely nervous and didn’t know what to expect. He wished he had his dog, Trouble, at his side. 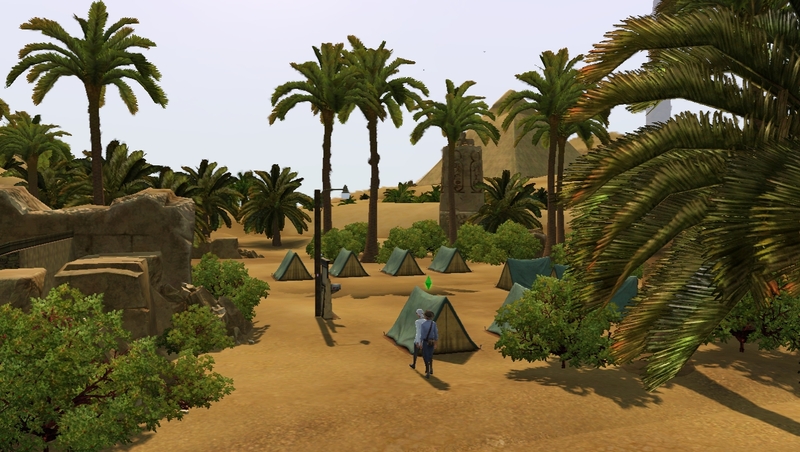 The tomb was situated right by the camp, separated by a small chain-link fence. Indie was surprised, he had assumed it was a generator or storage building. The rusted fence groaned as he swung it back, but it moved easily and there was no lock. 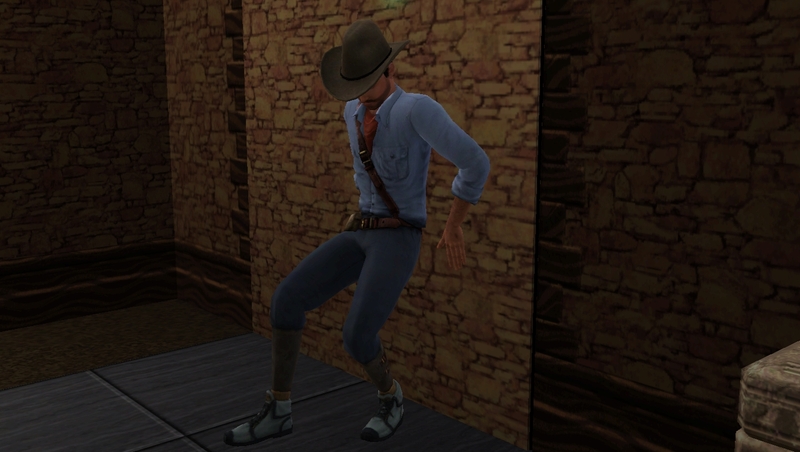 As he entered the building, he jumped! There was someone in there. 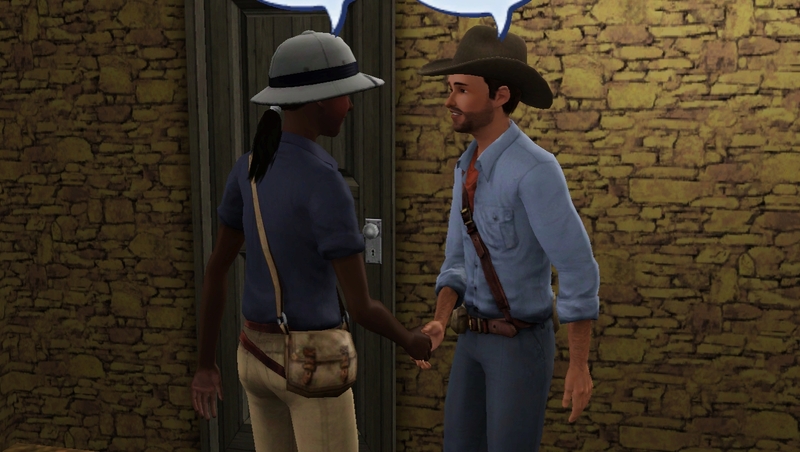 Thankfully, it was just another explorer and she seemed friendly enough. ‘I’m only here to collect some papers for Shadia Rashid, are these the ones?’ Indie gestured to the crumpled notes. 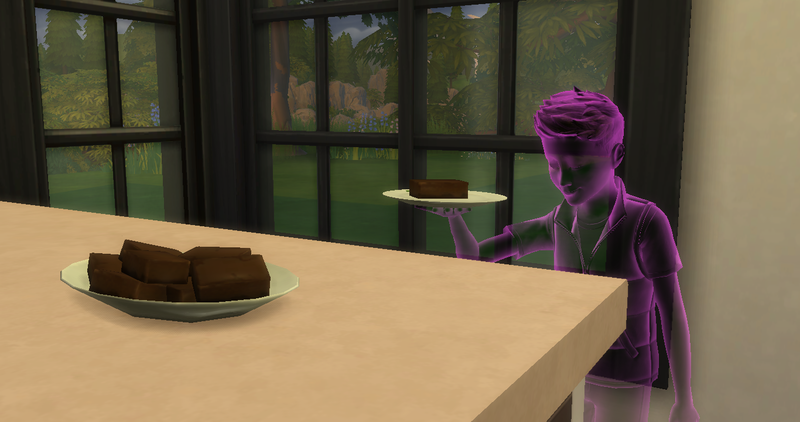 Indie was disappointed, he didn’t know what he’d been expecting, but it felt like he’d been fobbed off. ‘Frank’ turned out to be an old skeleton. Nice. Indie wondered why they hadn’t bothered to bag him and tag him. Maybe Shadia had been messing with him when she’d said he could keep whatever he found. He didn’t want Frank, but he felt bad that the guy had been left down there. The main chamber wasn’t much more impressive. There were some empty barrels against one wall, it appeared the tomb had been used as storage after all. 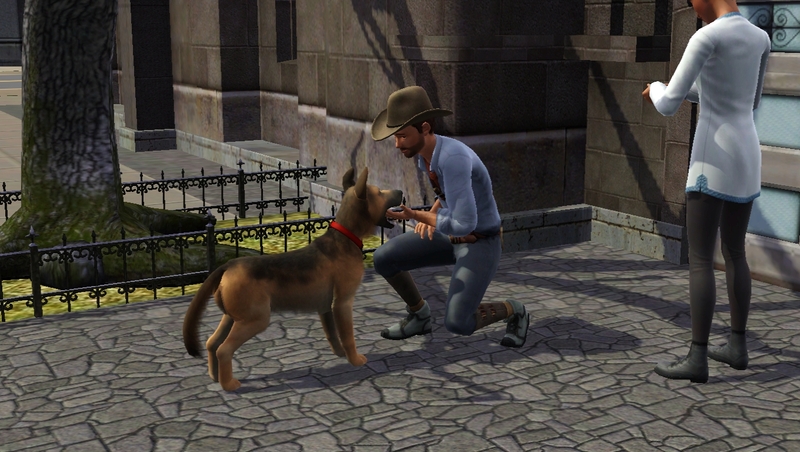 However, there were some old coins on the ground that were too common for anyone else to have bothered with, and Indie pocketed these as he thought they’d be interesting for his students to handle back home. 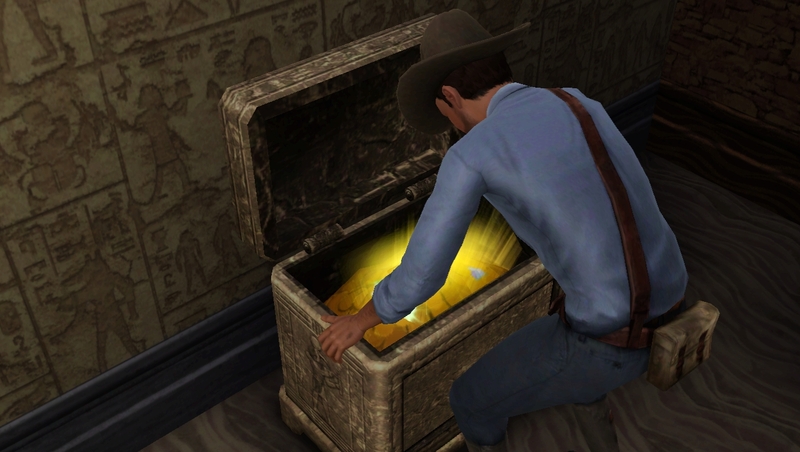 There was also a chest, but all it contained was the keystone to the next room. 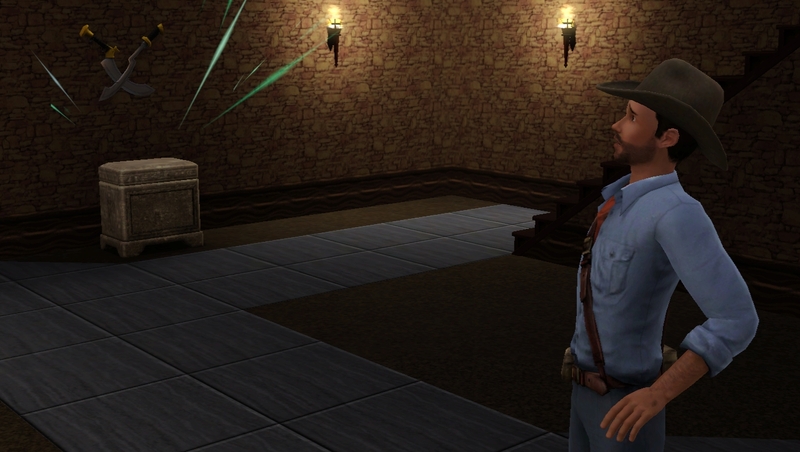 Indie felt a tingling sensation as he lifted the stone into place, what would he find on the other side of the door…? Indie sighed and sat down to rest against the cool stone. 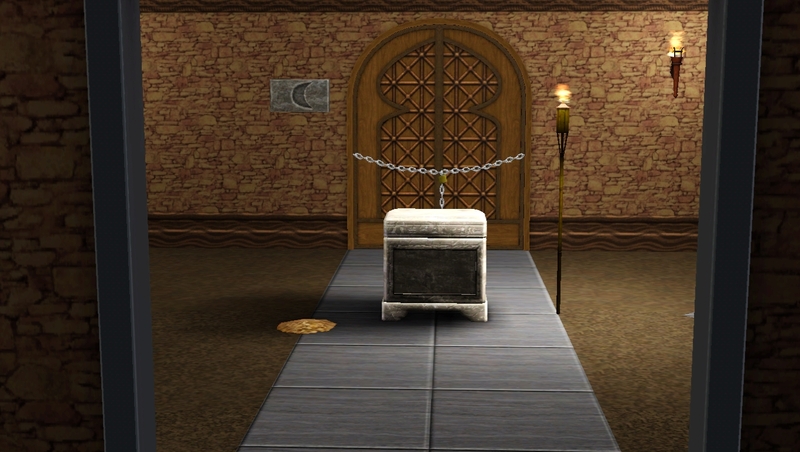 So Shadia really had given him a dud tomb. He had the impression that she didn’t quite trust him. 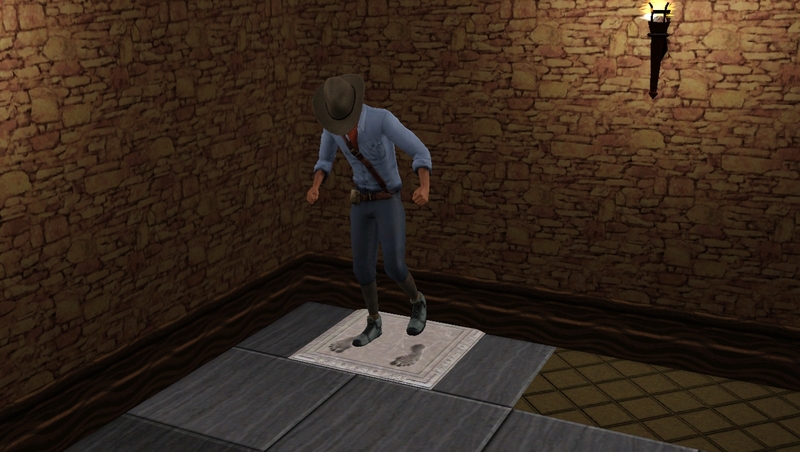 Frustrated, he was about to leave when he noticed an oddly shaped slab on the ground. On closer inspection he could make out the imprint of two foot-shaped marks in the stone. Curiously, he positioned his own feet in the grooves. The stone moved. Indie stumbled back as the ground before him rumbled and fell back, revealing a staircase leading down into a gaping black hole. Had nobody discovered this before? 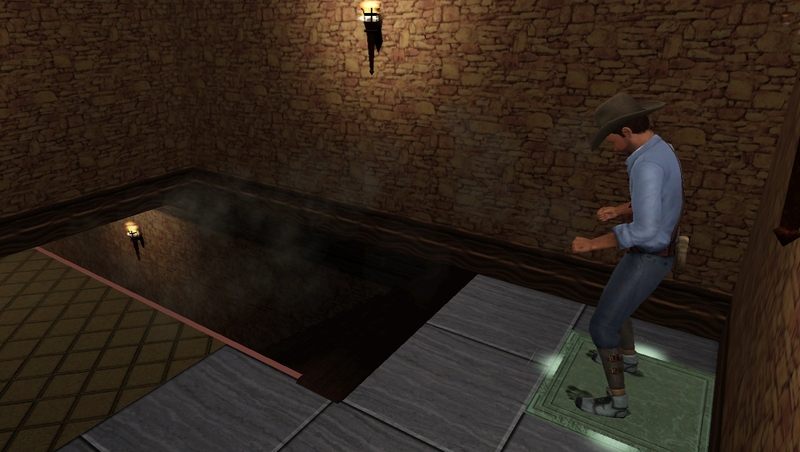 Indie thought to himself as he carefully descended and lit the torches in the room below. 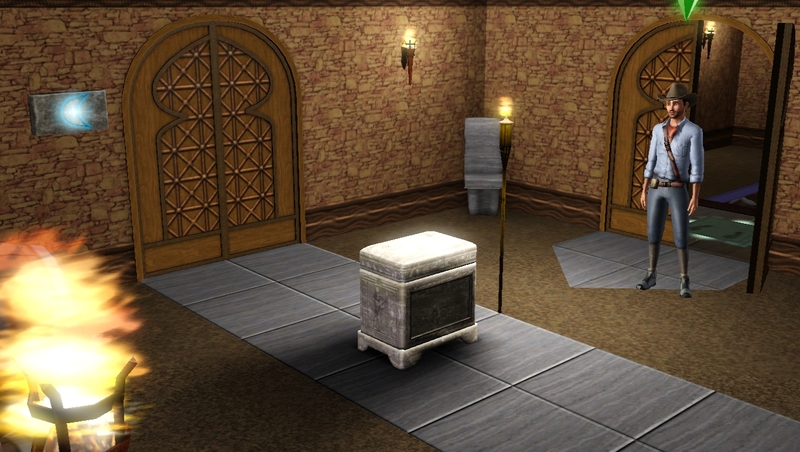 It was some kind of entrance hall, with black stone heads guarding another door. And there was another Frank. 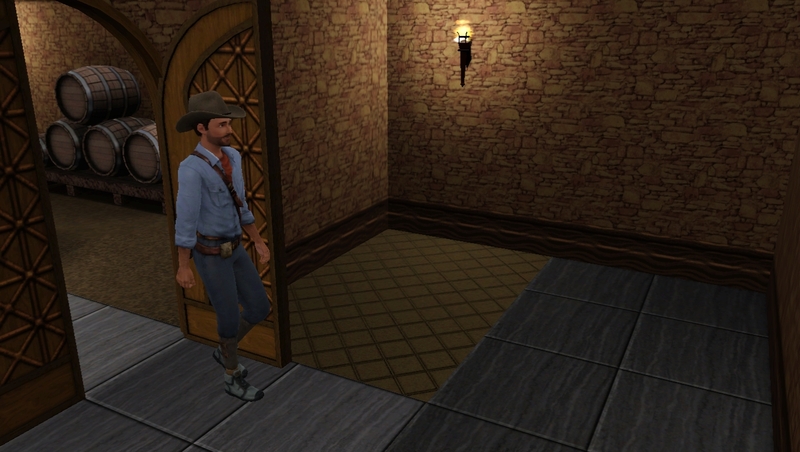 Indie looked worriedly back at the staircase, he was scared it would close behind him. Looking around he spotted another weird symbol etched into the stone floor and curiosity overruled his better judgement. I’ll be fine, he told himself, Kara knows I’m here, and she’ll hear me shout if the steps close behind me. Amazingly, his phone still had a weak signal too. 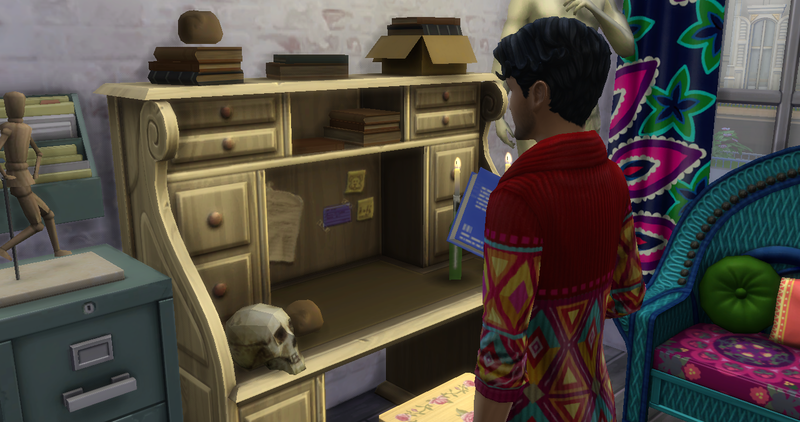 He thought about calling Kara, or even Shadia, but he wanted to explore a bit more first. 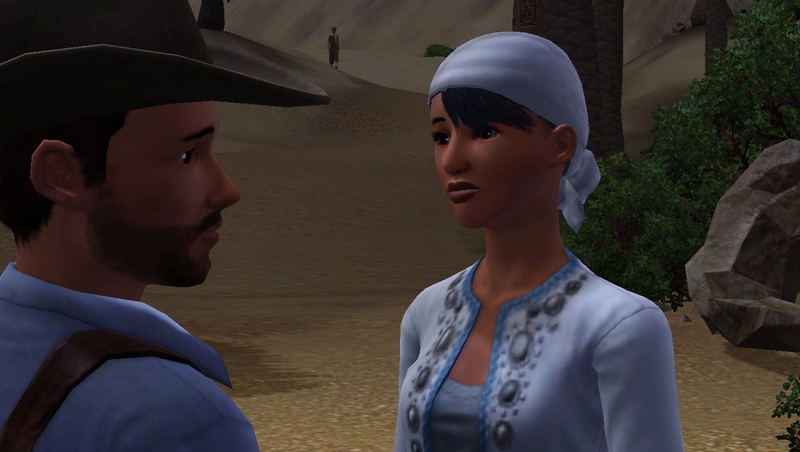 He was irked by how Shadia seemed to not trust him, and he felt like he had something to prove. He’d wait till he had a little more information first. 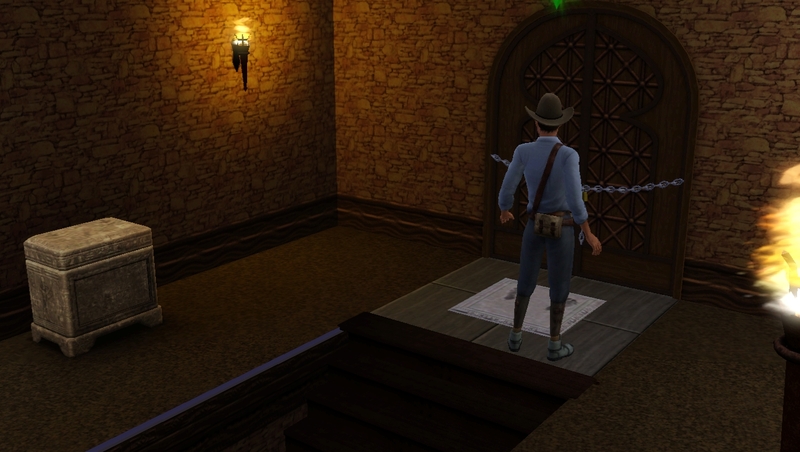 Indie stood on the etched stone like he did before but nothing happened. Maybe it needed something heavier? 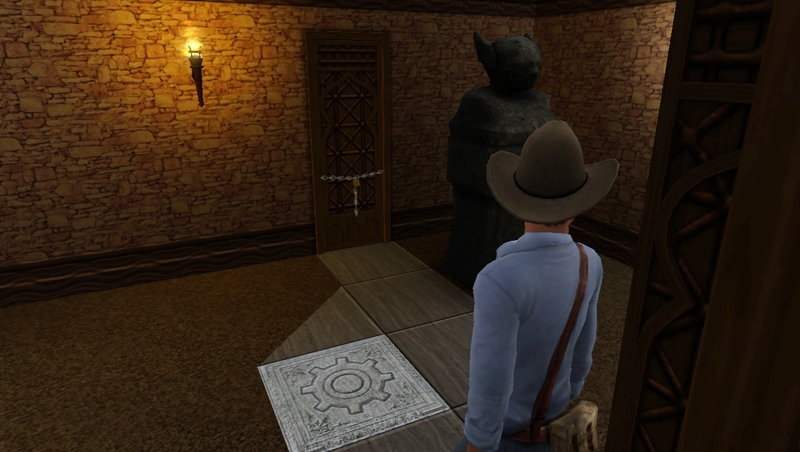 There was a statue placed conspicuously in the centre of the room, maybe he could push it? He could! 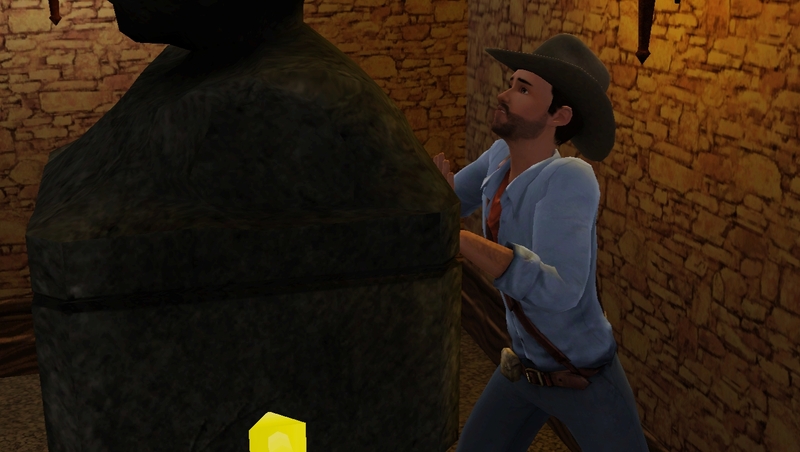 Indie grunted as he dragged and pushed the statue over to the stone panel. If he was going to be doing this regularly he’d need to start working out again! 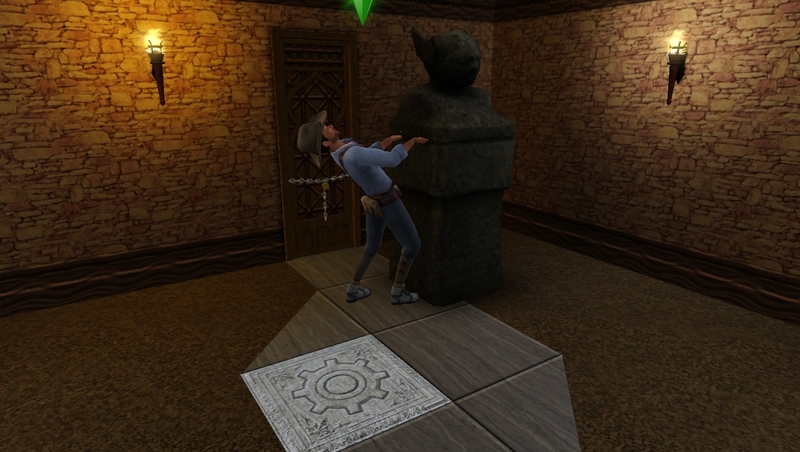 Finally, he got the heavy statue into place and the stone depressed with a clunk. 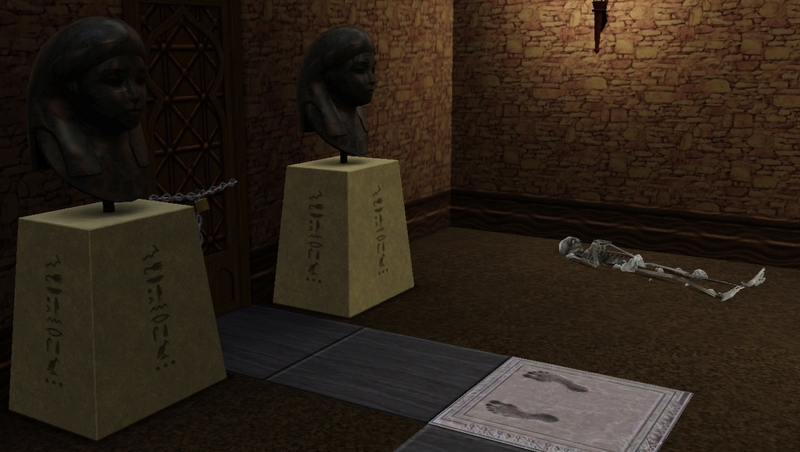 Indie groaned, the next room contained… more statues! 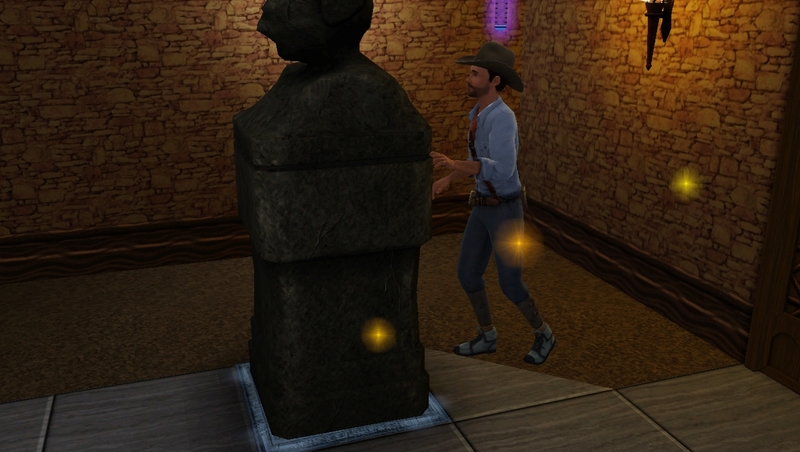 After much sweating and panting, he’d dragged the statues into the right positions and he discovered a large room that must have once been a burial chamber. There was another chest! Inside there was… a folder. It was Shadia’s papers! 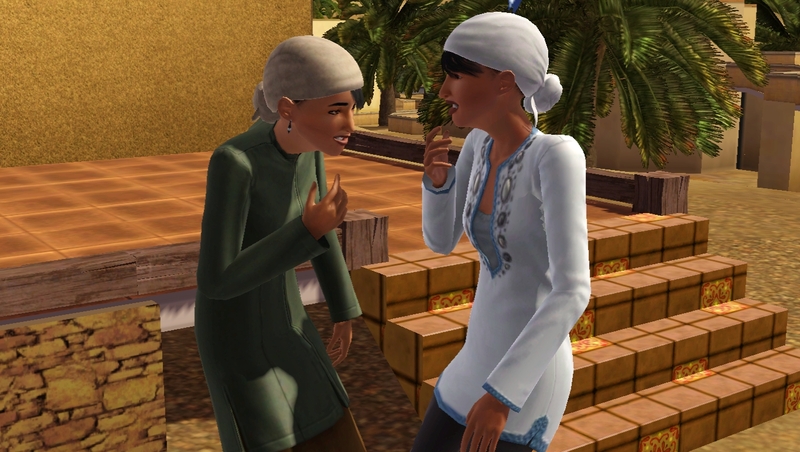 So, Shadia had known about the hidden rooms all along, but she hadn’t told the other explorer about them. Was this some sort of test? Indie wondered, scratching the back of his head thoughtfully. 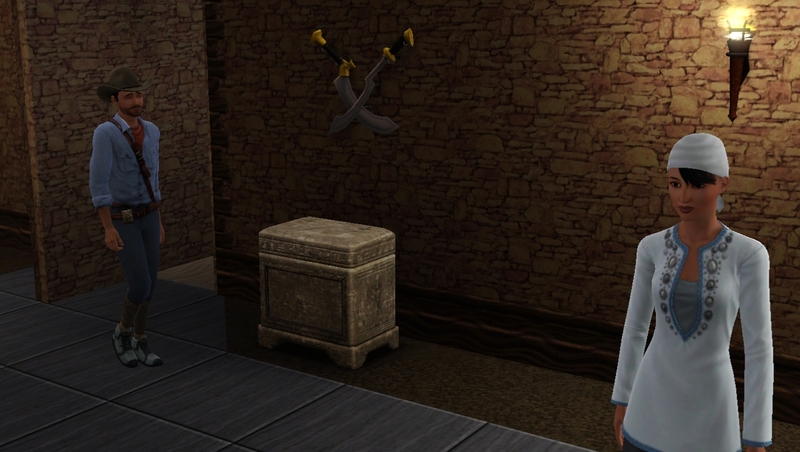 Indie was about to make his way back to the surface when he noticed some odd markings on the wall. He banged on the stone bricks, a hollow sound echoed back to him. 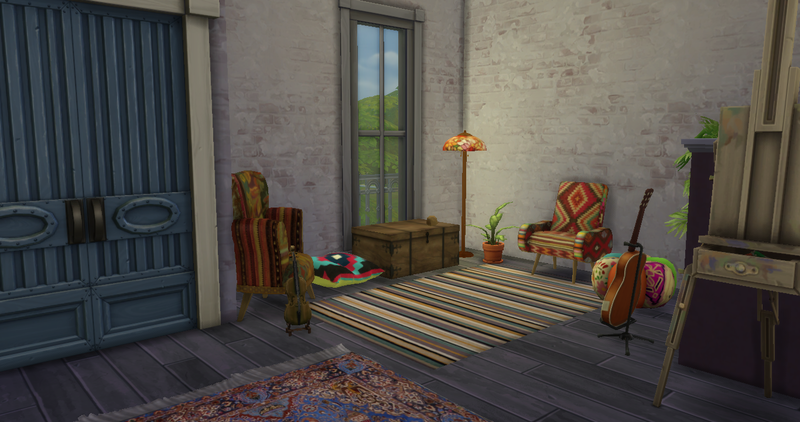 There was a hidden room! 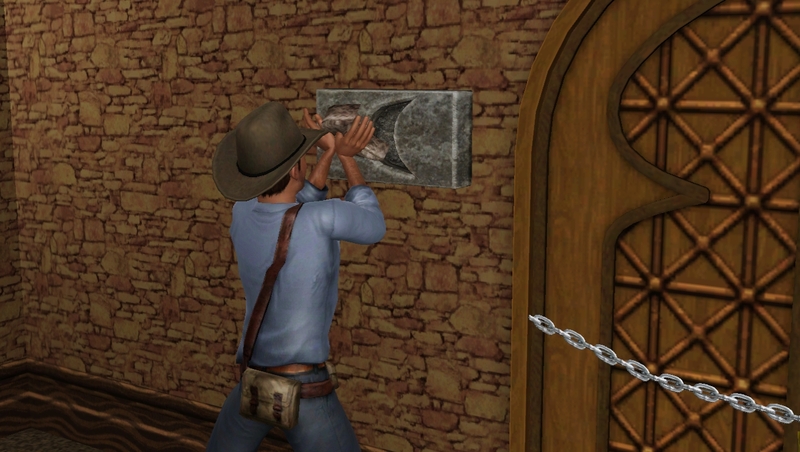 He explored the wall with the tips of his fingers and traced a cracked outline that must be some sort of door. 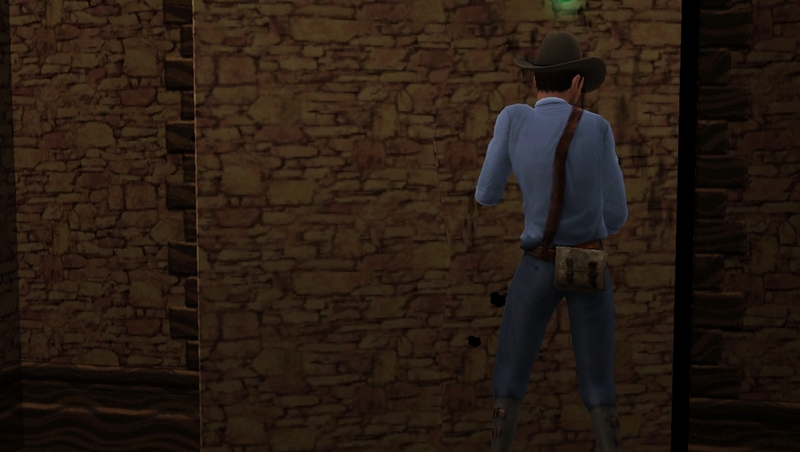 Exhausted from heaving the statues about, he threw what little strength he had left against the wall. Little by little it began to move. He pushed harder. Rock dust made him cough, and gravel fell against his head and arms as the wall groaned on it’s axis, eventually he’d pushed it back enough to reveal a tiny treasure room beyond. 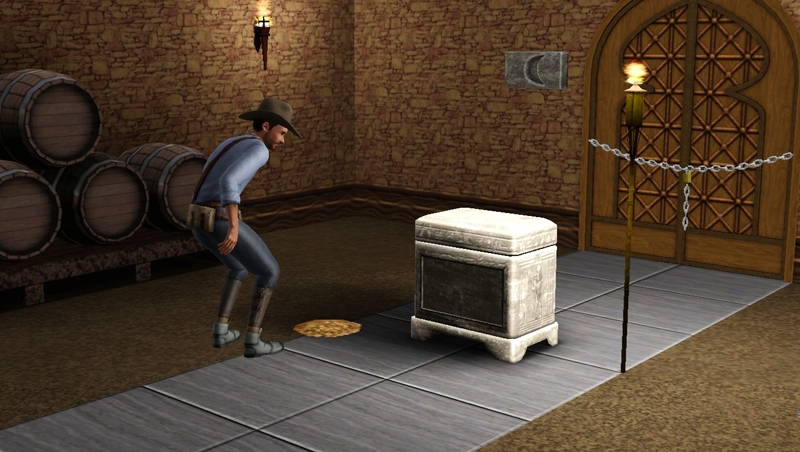 Indie could have scooped up the treasure for himself, but he was no thief! He was an academic first and foremost. 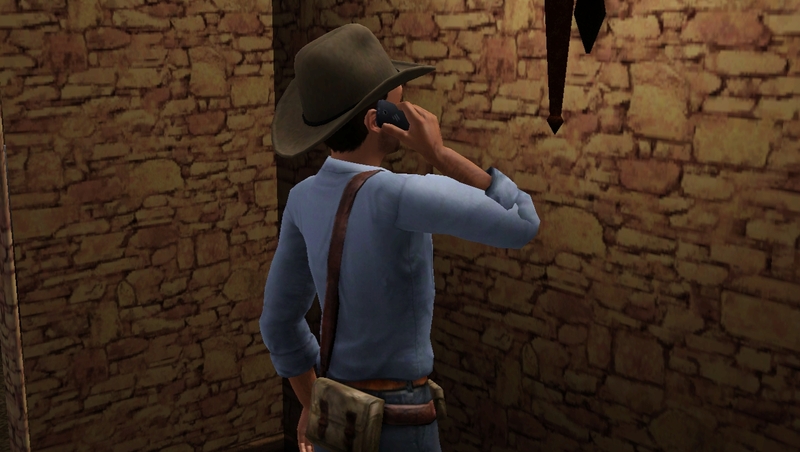 Excitedly, he called his wife and gave her directions to the tomb. ‘Watch out for Frank One and Frank Two,’ he teased. 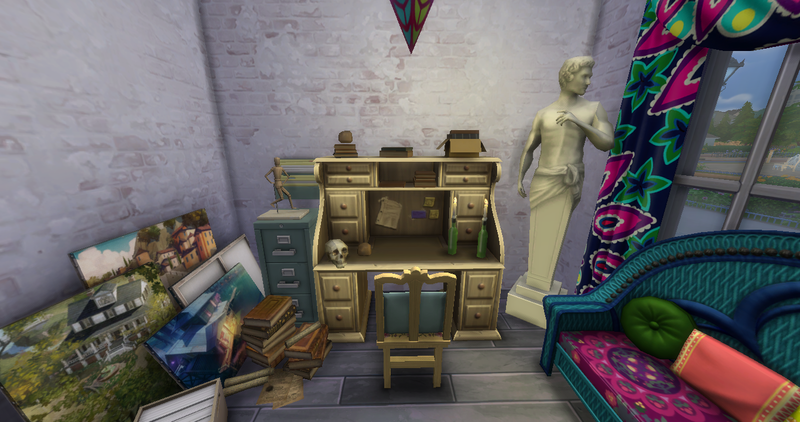 Indie explained that he wanted her to photograph and sketch the hidden treasure room before he touched anything, and Kara excitedly obliged. 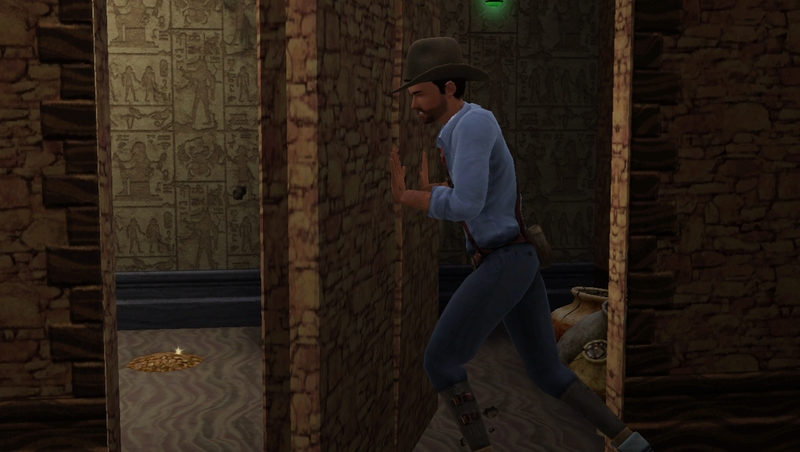 While he waited, Indie continued to explore the tomb and found an alternate entrance, an easier way to get back to the surface. 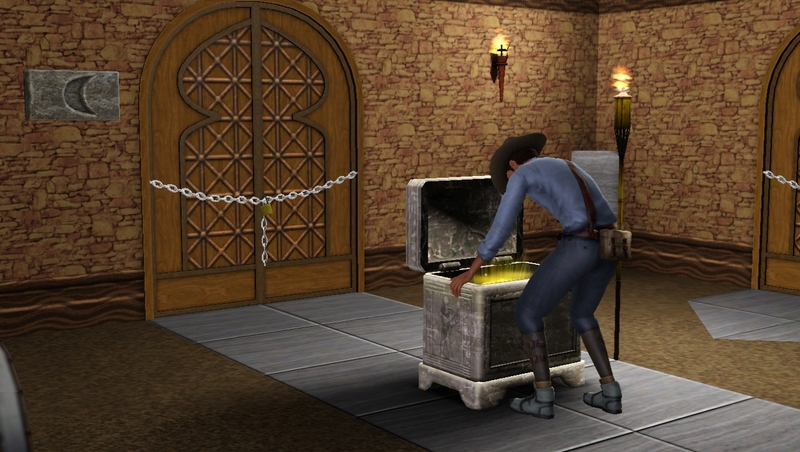 There were some copper ingots in a chest, not worth much, but Indie collected them anyway. 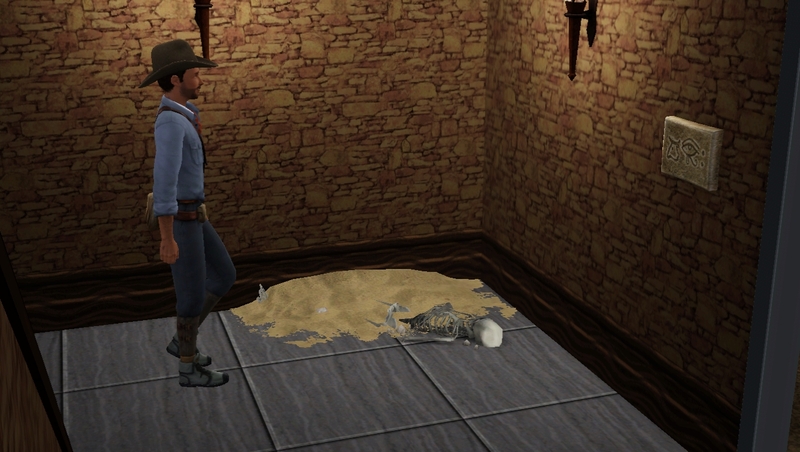 Indie raced back to the room and eagerly gathered up the ancient coins that littered the floor. 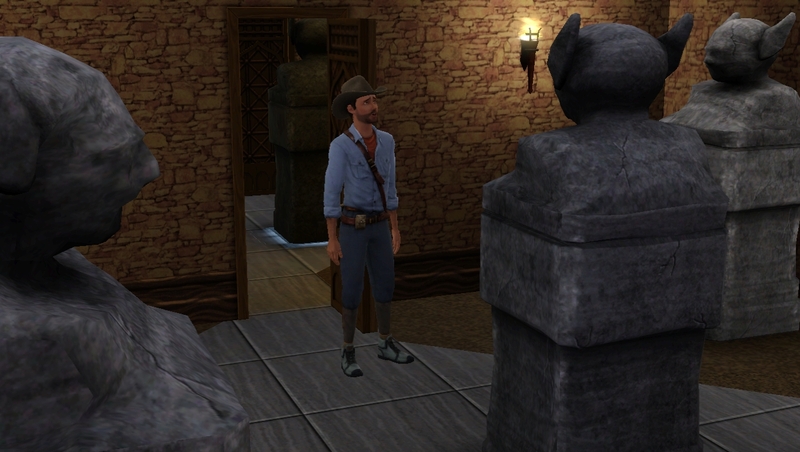 Inside the chest he found an impressive-looking stone sculpture which he would be pleased to claim as a prize for all his hard work! 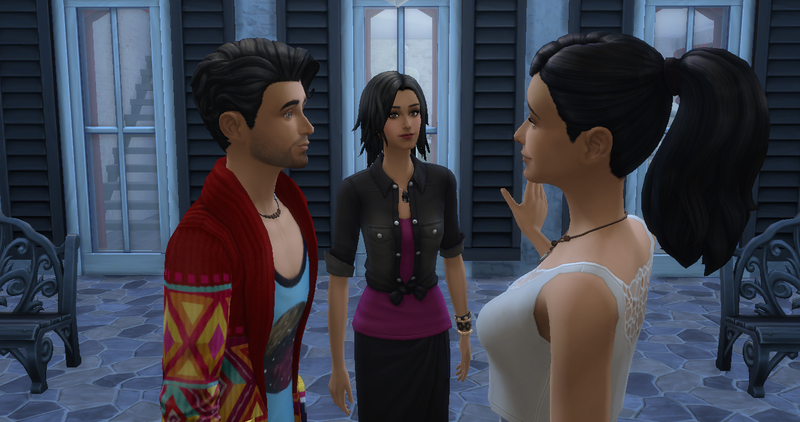 He hoped Shadia meant what she’d said about him keeping whatever he found. 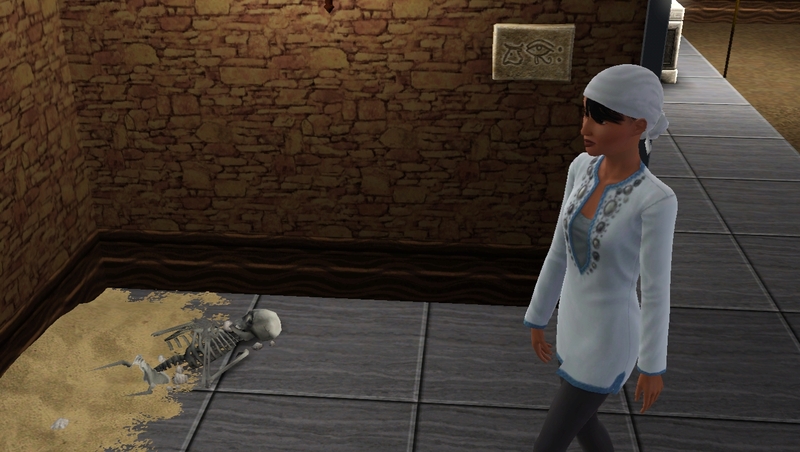 As they walked back to the surface, Kara glanced at one of the skeletons and felt a wave of panic. Suddenly she felt trapped, like she couldn’t breathe, and she raced back out into the cool night air. 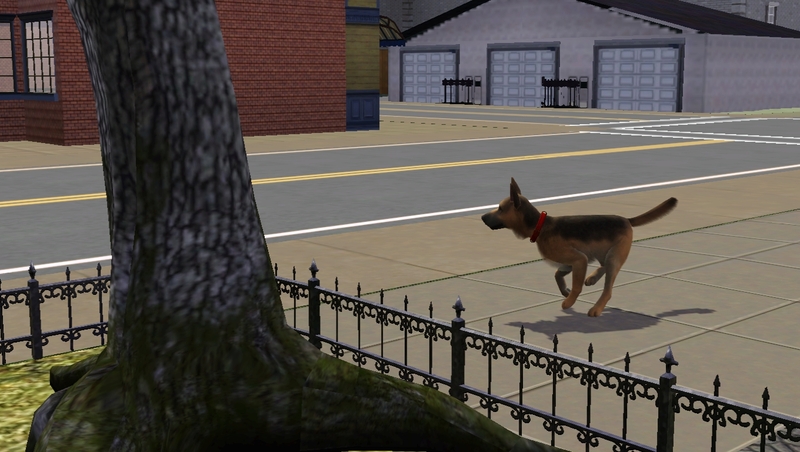 Indie ran after her, he’d never seen her look so frightened. 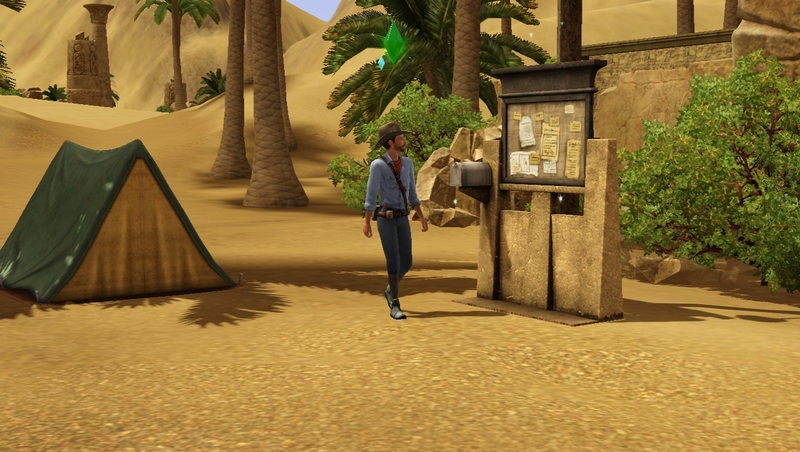 He caught up with her behind the notice board at the campsite. Indie felt terrible. 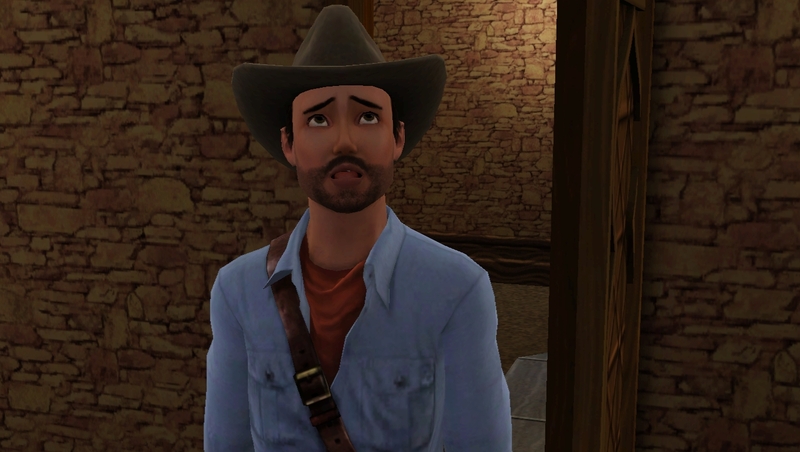 He’d been so caught up in his urge for adventure that he hadn’t thought of the impact it would have on his wife. The strain she must have felt every time he would enter a tomb. Those skeletons served as a warning for what could so easily happen to him. 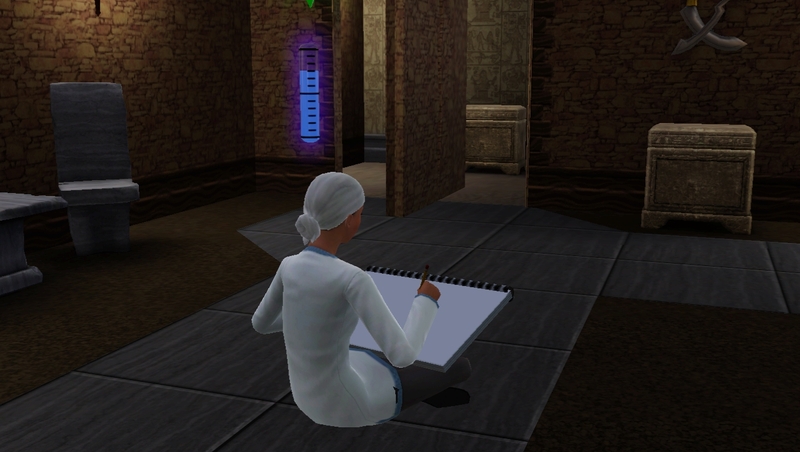 At the market, Kara sat down to sketch some of the locals. 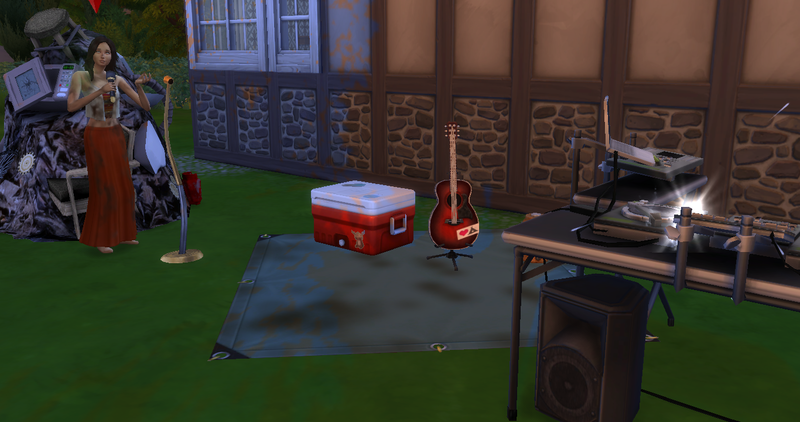 Indie decided to pick up some supplies: some dried food; a shower in a can; a tent; and… a gift for Kara. It was a bit expensive, and it probably wasn’t the best idea to buy it from a small general store, but he got her a pro camera. He knew how much she wanted to photograph the sights, and a cheap disposable one just wasn’t good enough for his sharp-eyed wife. 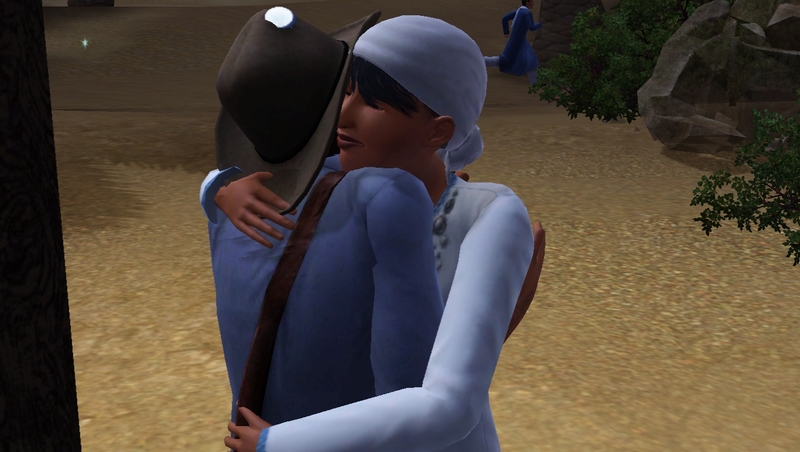 Plus, it was a way of saying sorry for ditching her back at the camp, even if it did blow a third of their budget. Kara tried to protest but she was secretly pleased, she began taking photos of the market straight away. 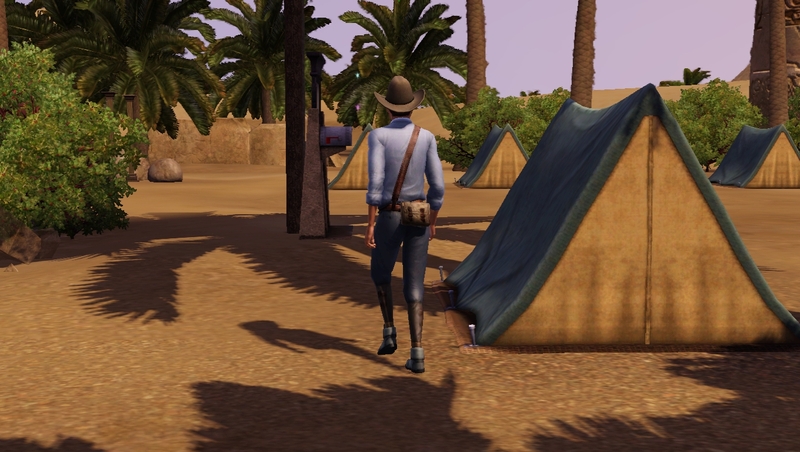 When he knew his wife was happily distracted he started to chat to the locals, sounding them out to see if there were any dig-sites or excavation work going on. The people he spoke to seemed a bit cagey, he got the feeling there was work, but they didn’t want him to know about it. He must have been chatting for a while because Kara called him over. She’d finished taking photos and had bought them both some falafel. 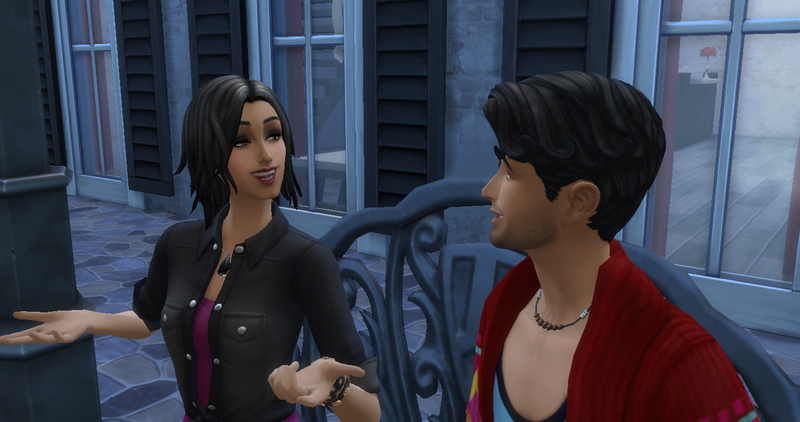 Indie told Kara about his past adventures as they ate with a gleam in his eye. 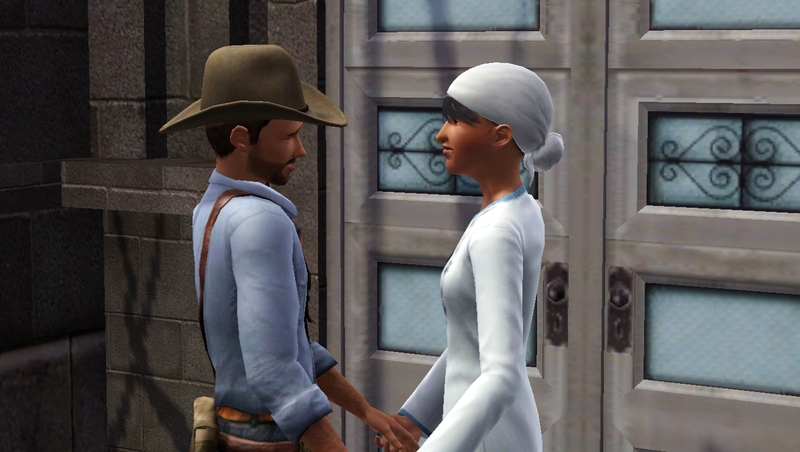 She knew he loved his academic career, but she could see how much he missed working on-site. 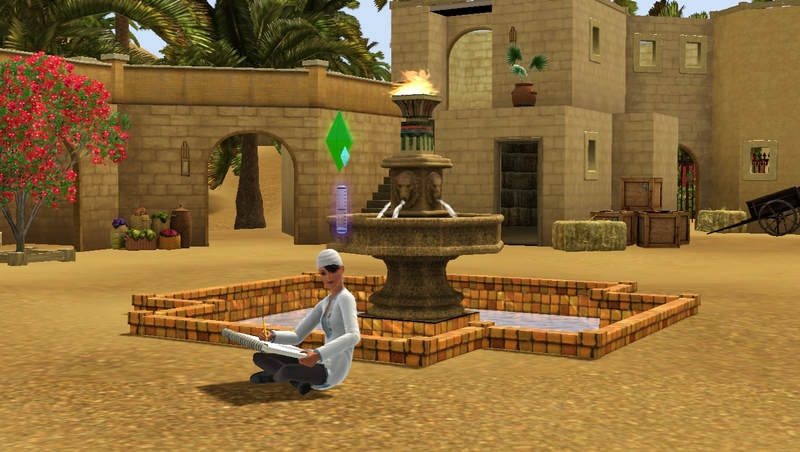 Reading journals and looking at images on the internet just wasn’t the same as feeling the sand running through your fingers as you make that great discovery. She just had to help him get some work. Well, that sounded promising! 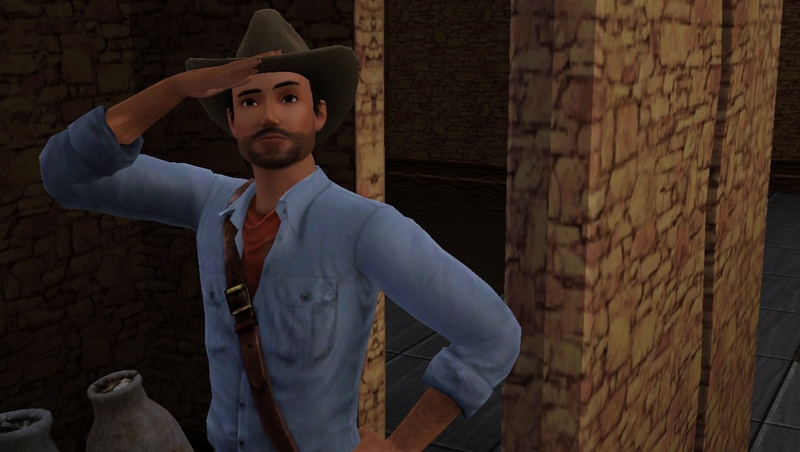 He was wary of the con-artists and smugglers who tricked students into excavating sites illegally. 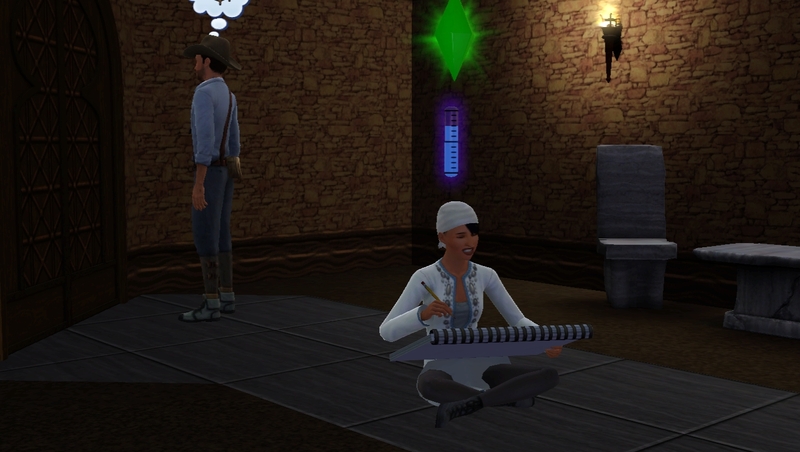 Indie wanted to find legitimate work. 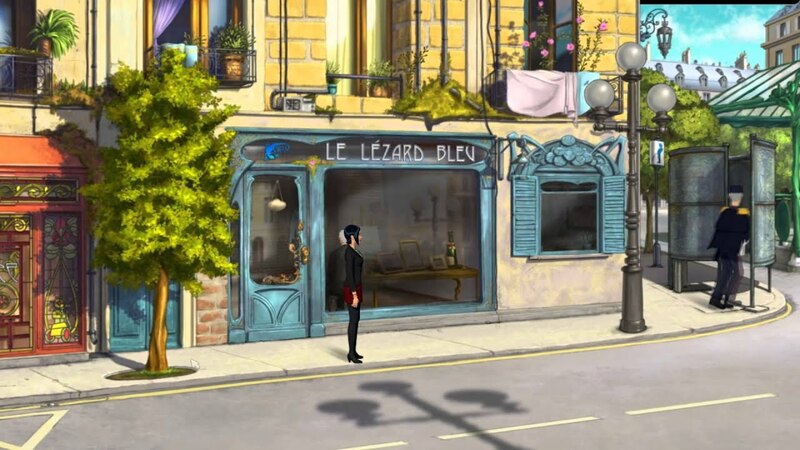 And if this MorcuCorp was really working with the local authorities, then it could be what he was looking for. He showed the card to Kara, she hadn’t heard of MorcuCorp, but the name of the contact sounded familiar. 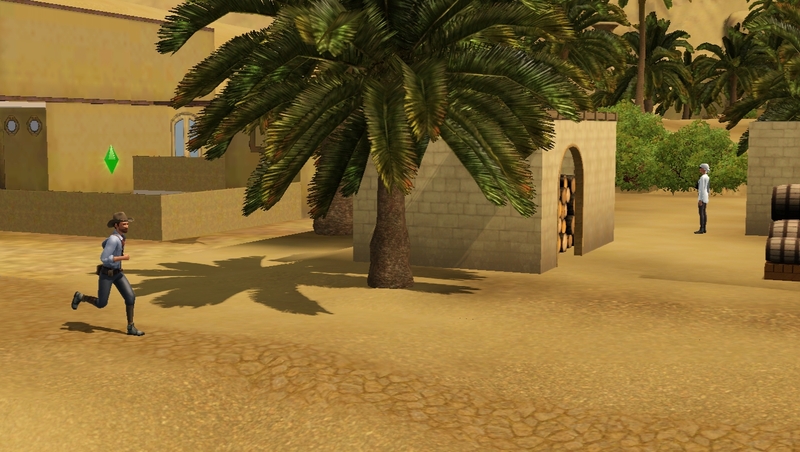 They left to meet their contact Shadia Rashid, at her home Papyrus House. He introduced himself confidently, showing some of his previous work on his phone. 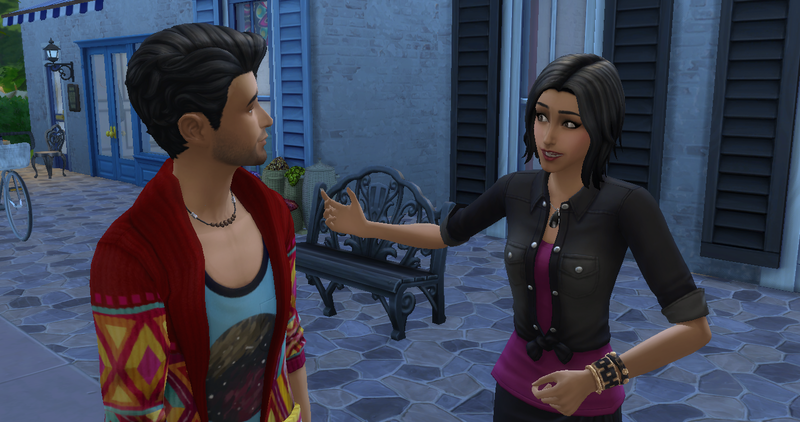 His charm had never failed him before, but Shadia seemed almost hostile towards him. 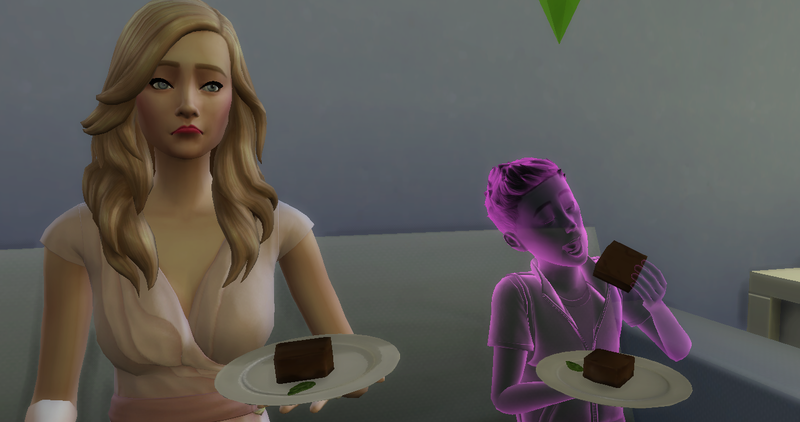 She knocked the phone from his hand and it cracked on the ground, Indie wasn’t sure if she’d done this on purpose or not, but he felt his stomach tighten with disappointment. Fortunately, Kara showed up just in time. 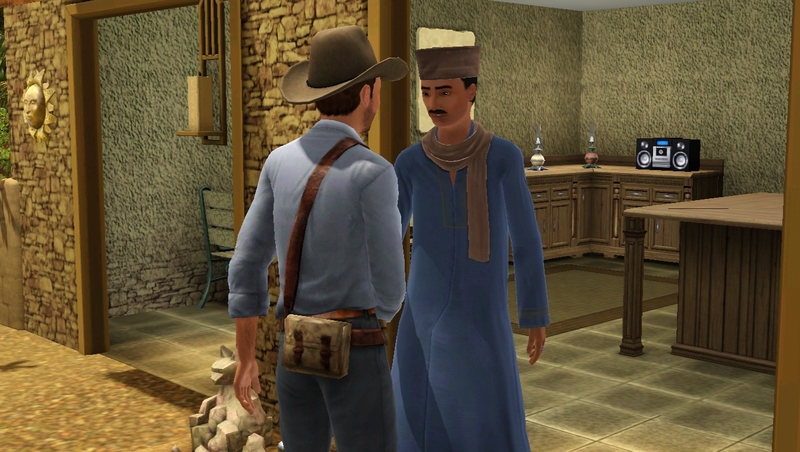 She rushed forwards and began supplicating Shadia in rapid, earnest Al Simharan that Indie could barely follow. 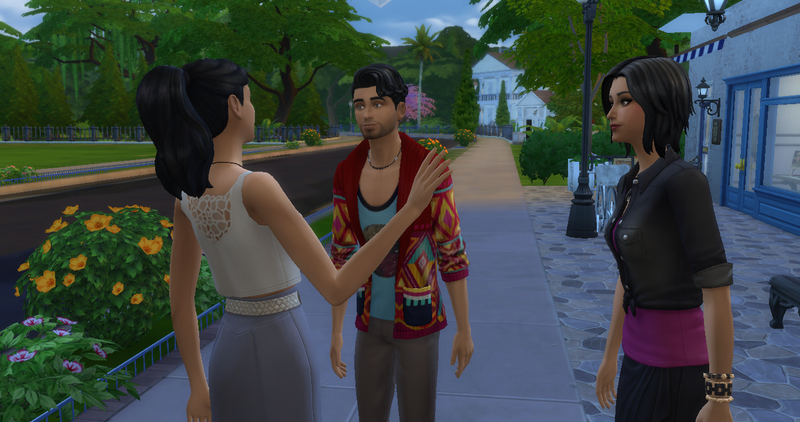 Soon a smile broke out on Shadia’s face and the two women were giggling like old friends (maybe they were, Indie wasn’t sure). 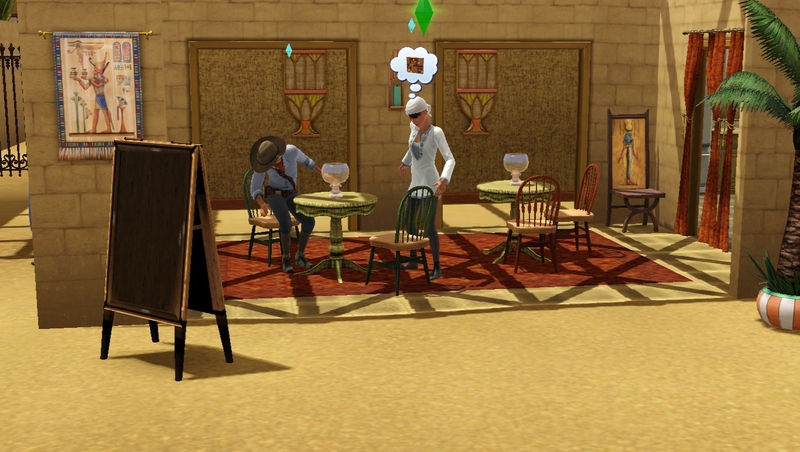 Indie gestured wildly to his wife, ‘Ask her about work!’ he mouthed. 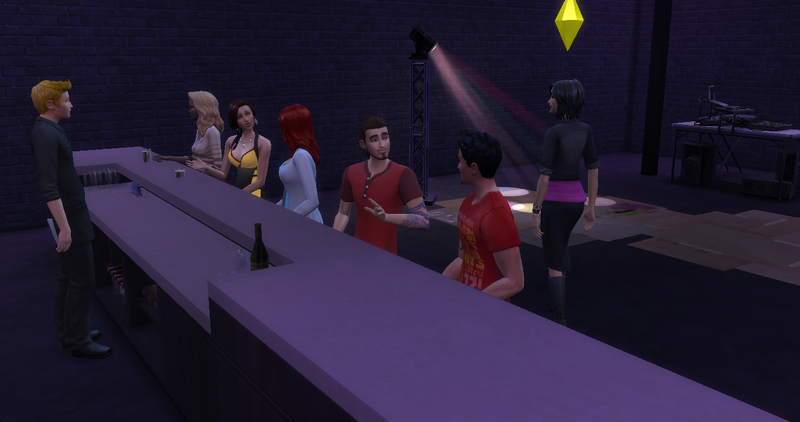 Kara continued chatting for at least ten minutes before finally securing him some work. 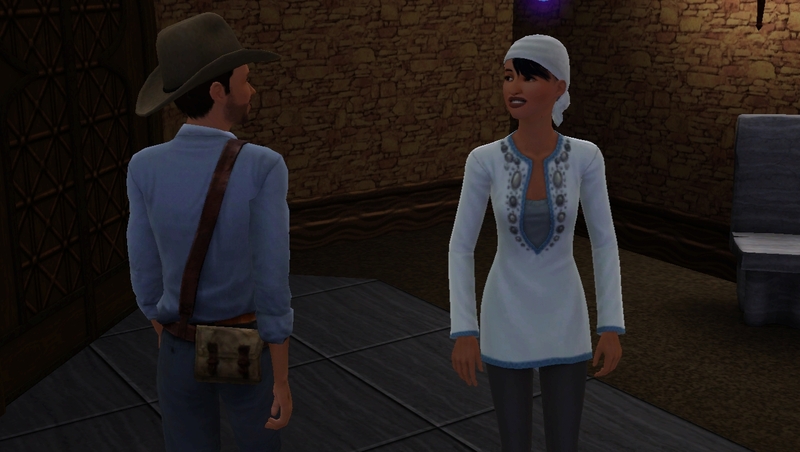 Indie thanked her profusely, and set back to camp to prepare. 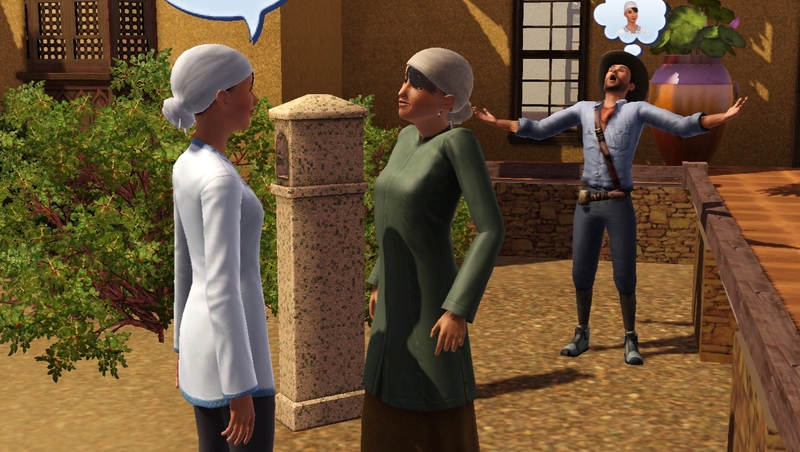 He left his wife chatting ceaselessly with Shadia, she seemed to be enjoying gossiping about her old home. 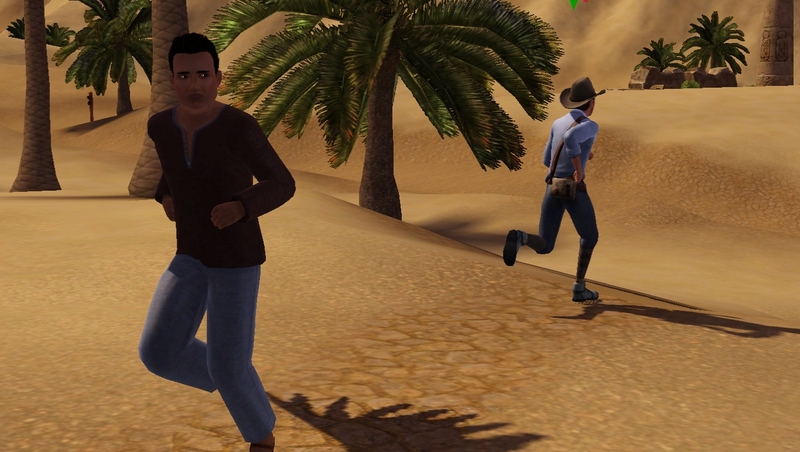 As he made his way back down the winding path, a man ran past him. 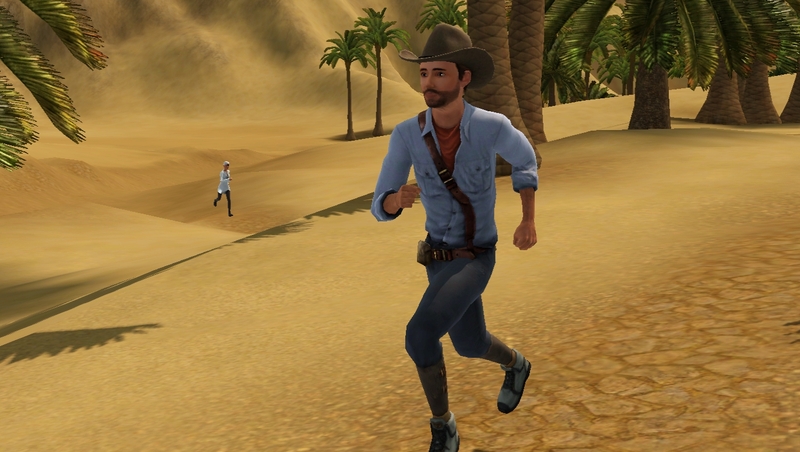 He smiled, but the man scowled distrustfully and continued jogging up the path. Indie was confused. The locals had been so welcoming when he had visited several years before as a student. What had changed? 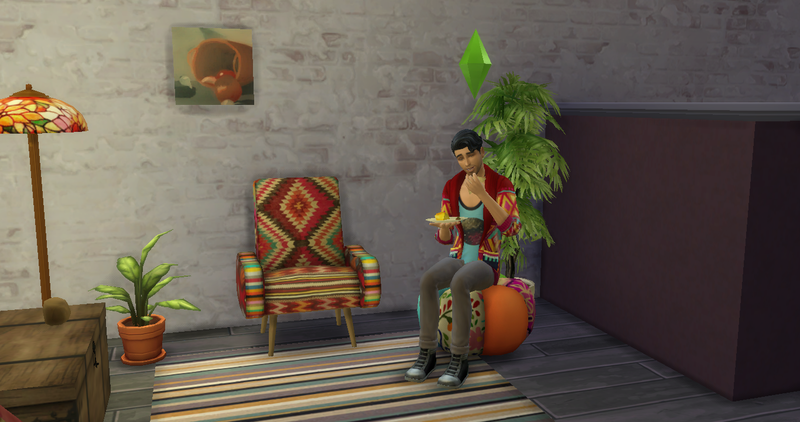 So, I made a couple of brand new sims! 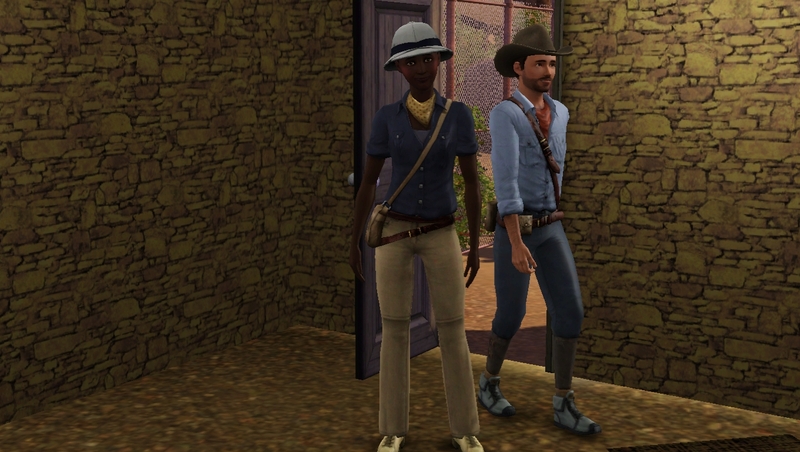 My idea was that I’d have a typical Indiana Jones style adventurer who could do the exploring, but I also wanted a female companion who would take advantage of the beautiful scenery by painting and photographing the landscapes. 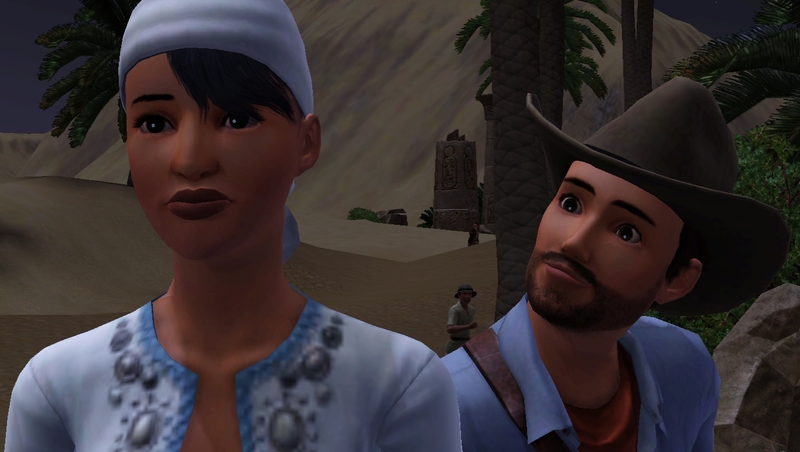 So, I created Indie Jones [creative name] and his wife Kara Maat [slightly more creative, her name is a play on Maatkare, an alternative name for the female pharaoh Hatsepsut, whose tomb can be found in the game. ‘Maat’ means balance and order, when ancient Egypt had a good ruler they would bring Maat to the land]. The couple live in the vibrant city of Bridgeport where Indie has accepted a job as a professor of antiquities [naturally]. 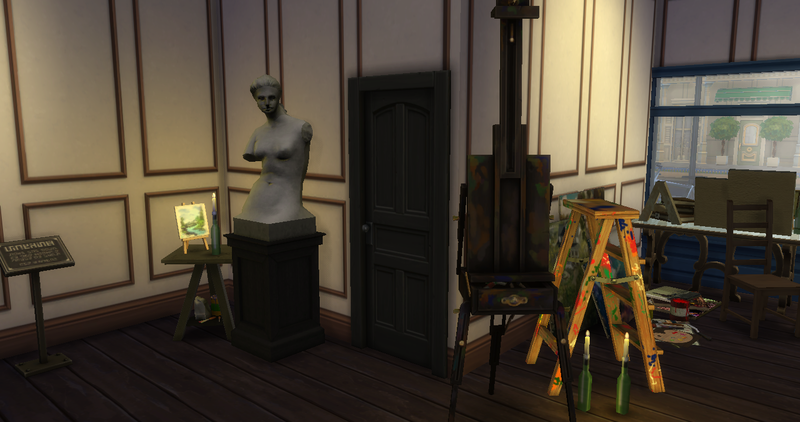 Kara is hoping to open a small art gallery to sell her paintings and photographs, but their apartment is tiny and unfurnished and they need to raise some funds. 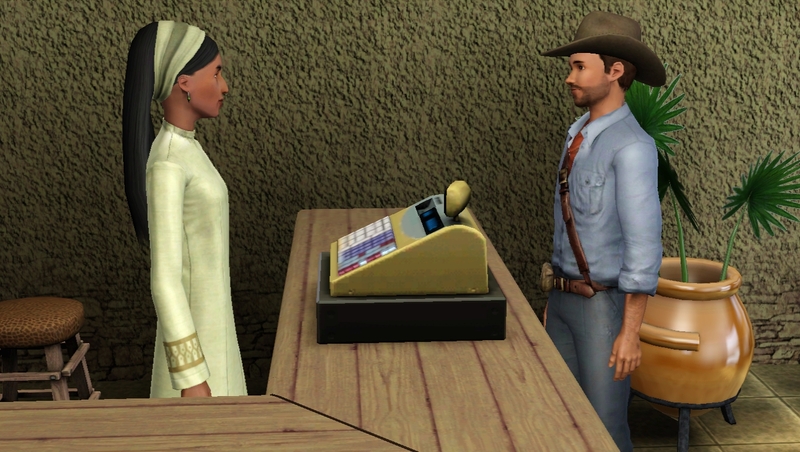 They have a little bit of money, and they plan to use this for their visas and their first trip to Al Simhara. Kara has family there, and she knows the place well. 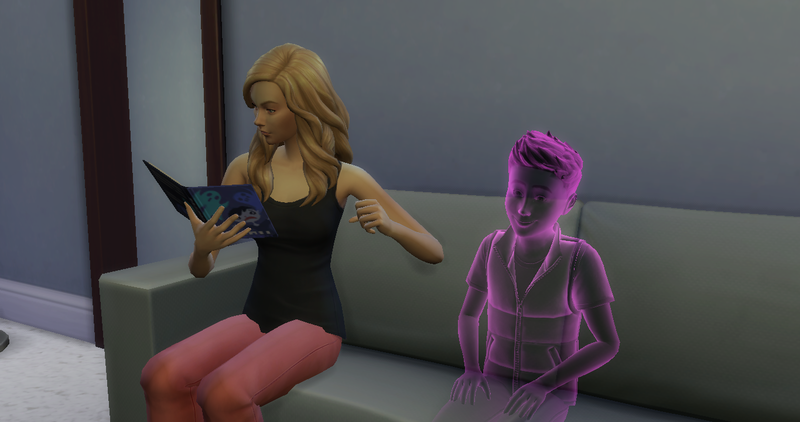 She is hoping her connections will help Indie get some work out there during the summer months, before he starts his new job next term. 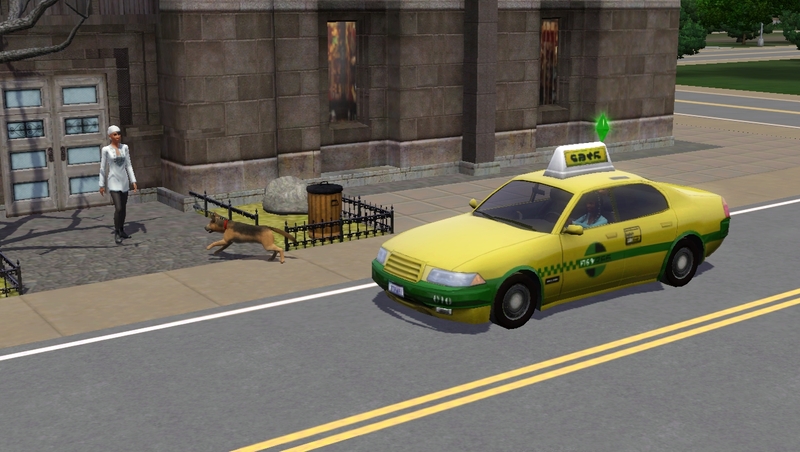 Oh yeah, and they have a dog… Trouble. I guess you can figure out why he has that name. Sadly, Trouble couldn’t travel with them this time as the visa only lasted 3 days and there wasn’t enough time to get him through the quarantine period, but maybe he’ll get to go one day if they get an extended visa. Indie and Kara packed a minimal amount of supplies, grabbed their papers, and said goodbye to Trouble before hopping in the cab to the airport. 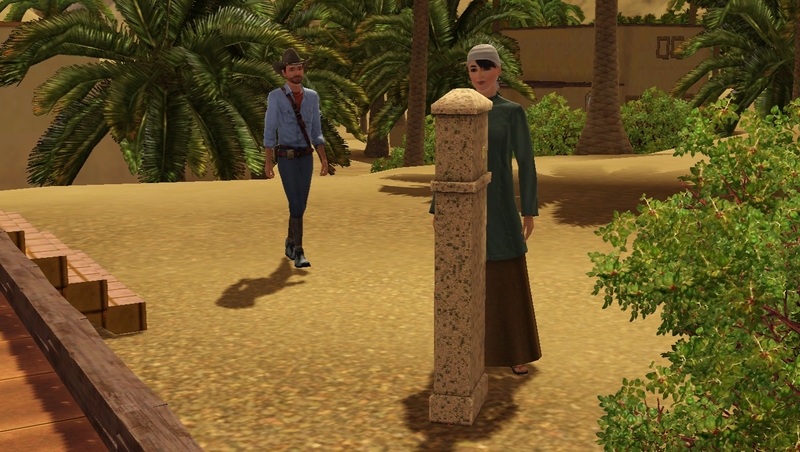 After a long flight they arrived in glorious Al Simhara. The base camp seemed clean enough, and the other tourists appeared to be pretty friendly. 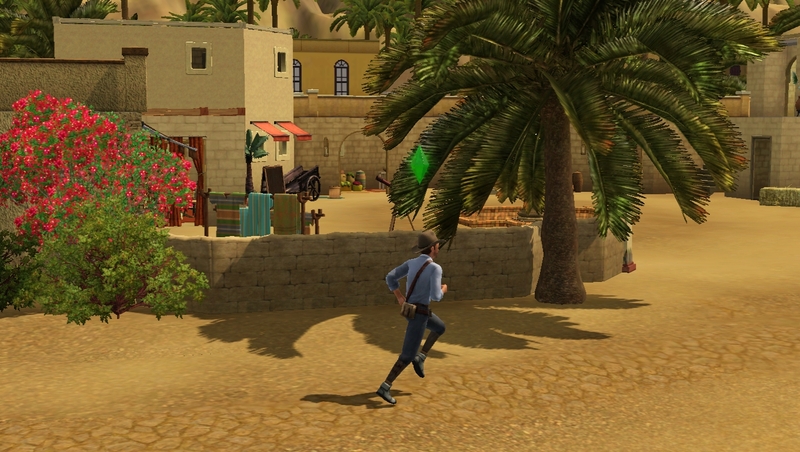 ‘It’s beautiful,’ Indie gasped as his eyes scanned the lush trees, a healthy green against the backdrop of golden sand. ‘Such a charmer!’ Kara chided playfully, giving him a big hug. 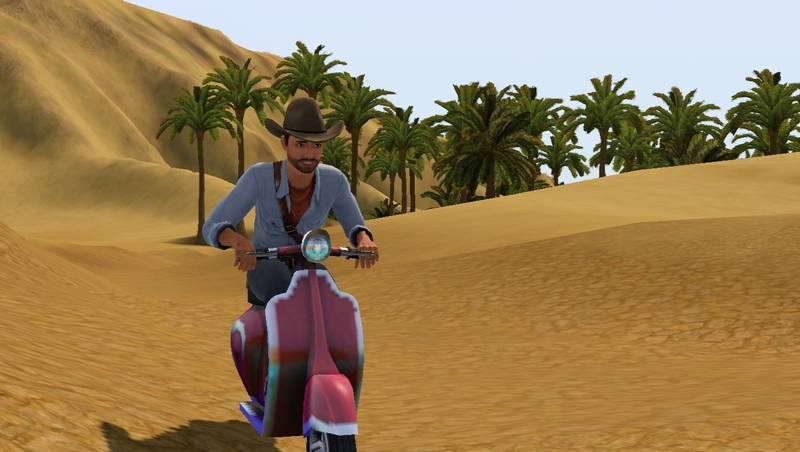 But Indie was already on his scooter, racing along the hard sand road. He grinned confidently as he roared away. 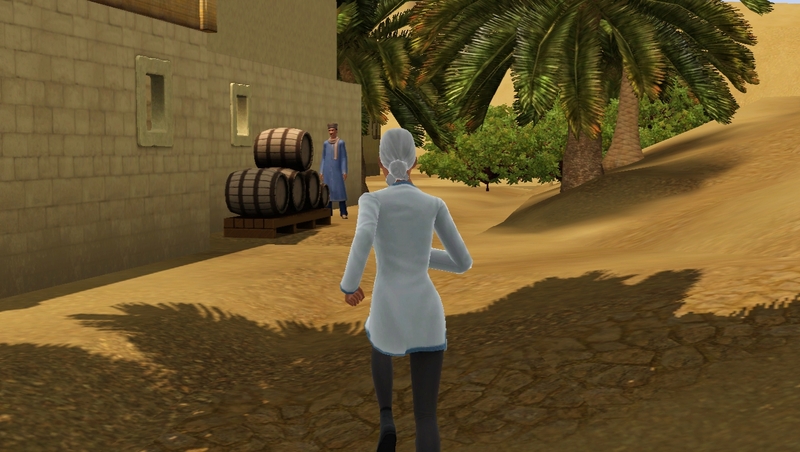 When he reached the path to the marketplace, he glanced over his shoulder. Kara was far behind him, there was no way she would catch up now. But Kara had a plan! She knew the sandy streets well: she’d played in the twisting paths between the houses with her friends as a child. Twisting off the main path she took a short-cut between some houses and ran straight into the centre of the market [she really did this by herself, I didn’t direct her]! She laughed as she saw Indie racing past at the top of the alley, he was so intent on winning the race that he didn’t even spot her waving. Indie groaned but was too busy catching his breath to answer. 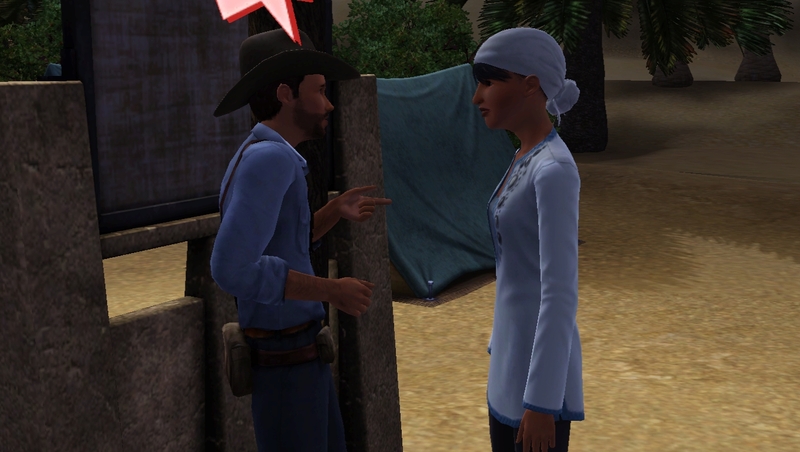 ‘That’ll teach you not to leave your wife in the middle of the desert!’ Kara scolded him playfully, pretending to look angry. The initial excitement of having a ghost protégé had worn off and Cinderelli was feeling nervous about her new role as fairy ghost-mother. What was she meant to do with this kid? She didn’t know the first thing about parenting! INTERNAL PANIC!!! Telling the sprog to go and do his homework seemed like the sort of thing a ‘good parent’ would do and a good way of distracting him while she thought about what to do next. FOOD! Kids need food. What kind of food do kids like? 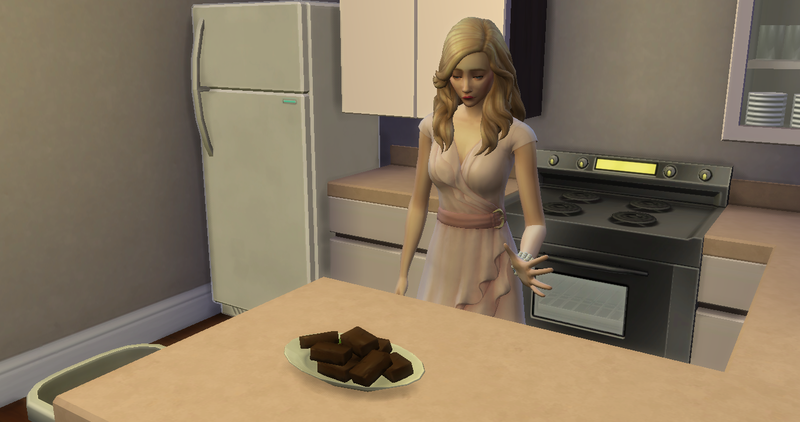 Chocolate brownies!!! 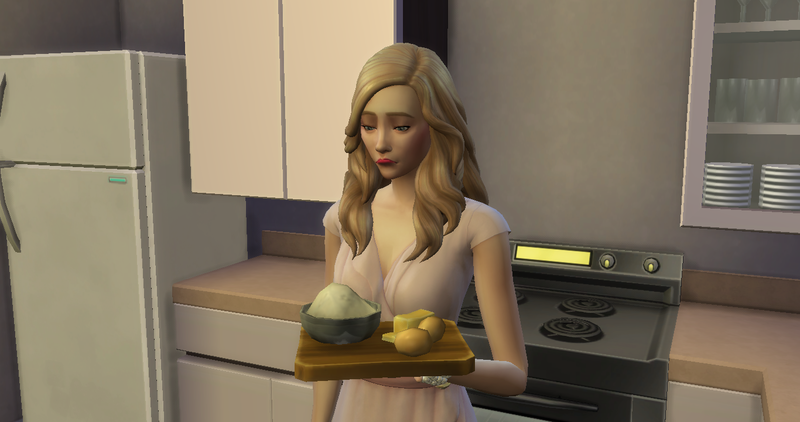 She might be a terrible cook, but she can do the baking thing! 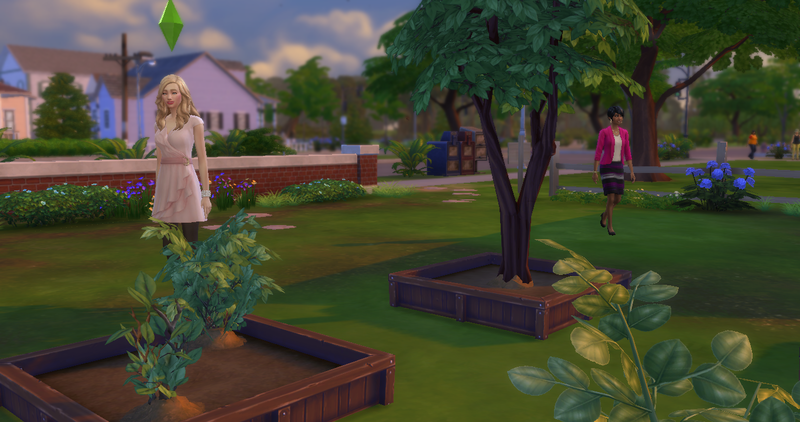 Rosy-fingered Dawn appeared and the new friends went to the community garden at Willow Creek to look for the new NPC. 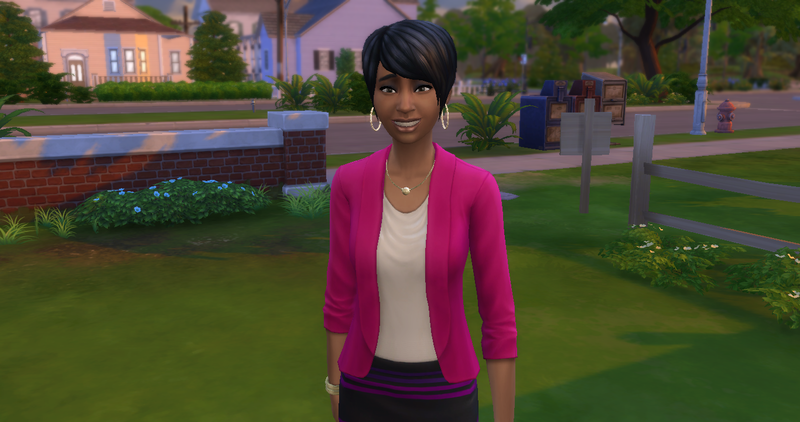 It took a few minutes of awkward standing around before Jasmine Holiday appeared. Cinderelli went over to greet her and they walked together. 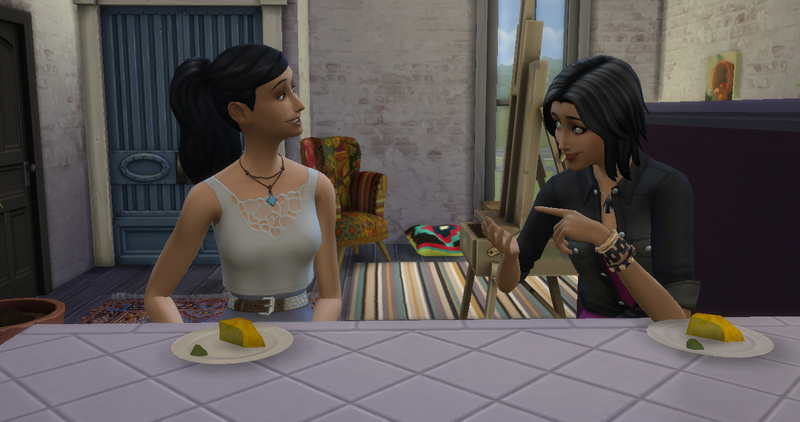 Jasmine’s expression made me laugh, like she thought Cinderelli-sim was bonkers [she is]. 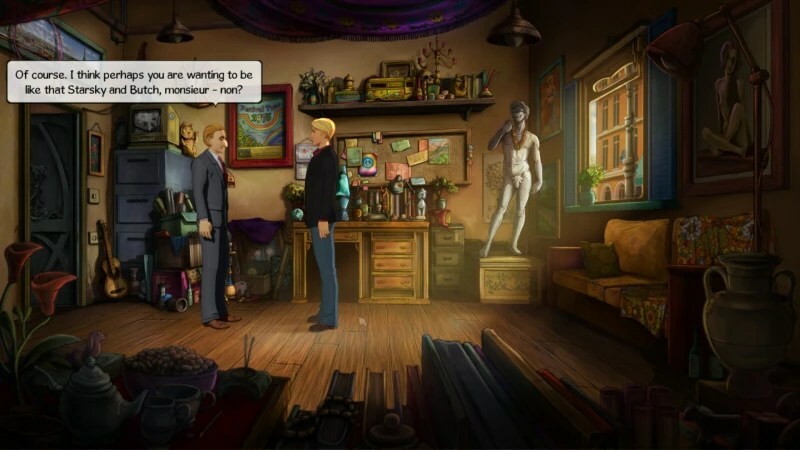 And… this is where it went a bit wrong for me. 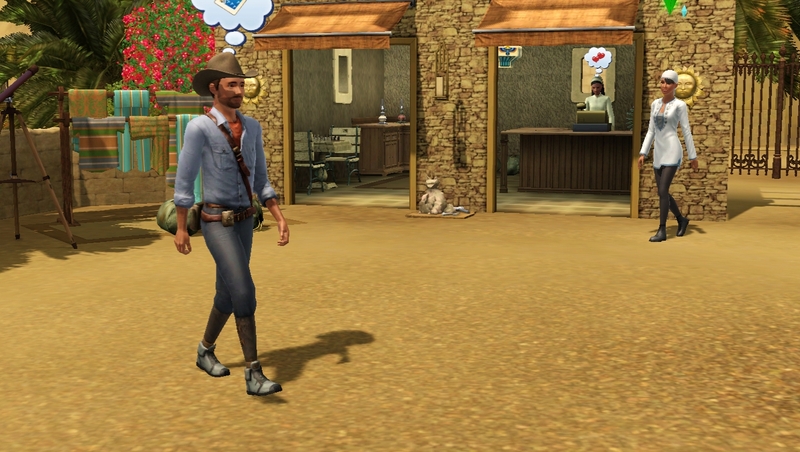 I have to admit I really like having this special NPC, and I like the new fruit, and the challenges! Only… I really dislike that this is timed. 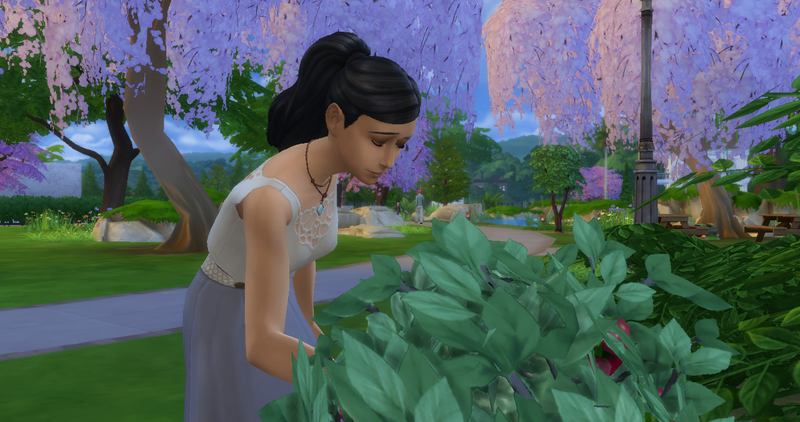 I had Cinderelli-sim plant the seed and she couldn’t use the special fertiliser to make it grow faster (maybe she needs a higher gardening skill?). 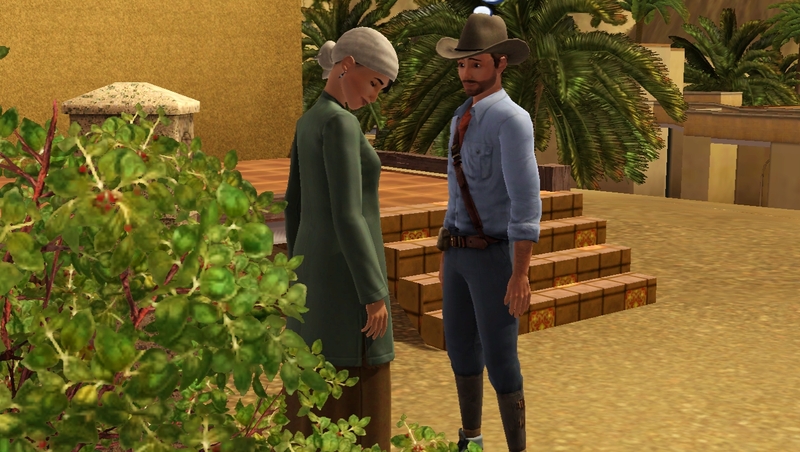 So I sent her to look around for wild growthfruit (I’d heard that was a thing but sadly couldn’t find any). So then I had to pass the time waiting for the fruit to grow. This normally wouldn’t be an issue for me. I’d plant the seeds and get on with playing my normal game. But the fact that it is a timed challenge, and the fact that with 2 sick kids and a ton of coursework I’m very short of time at the moment, meant that I felt very rushed. I had Cinderelli paint to pass the time, and was jumping to speed 3 while Parker was at school. I never use speed 3 usually and I found that I really wasn’t enjoying the game, it’s not the way I play. 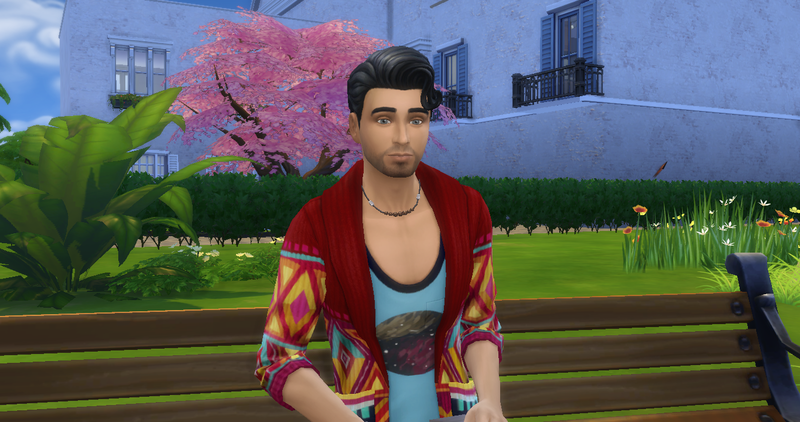 I felt like I was just trying to tick boxes and I wasn’t engaged with the game or my sims’ lives. You can tell, as a result I have hardly any screenshots. Finally the tree grew and gave me 6 fruit. 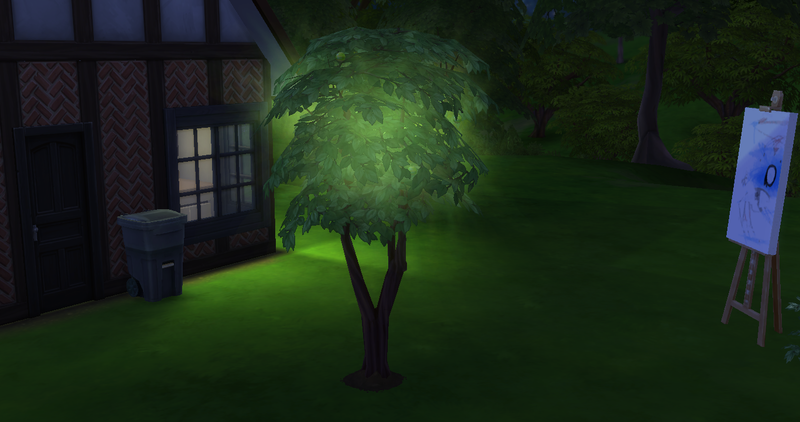 I replanted one and saved the rest for the challenge. By this point it was late and I’d ran out of time to play. Since my game time is precious, will I be completing this challenge? Probably not. I felt rushed and didn’t enjoy it. If this wasn’t timed, I would have really enjoyed this feature. But now I feel like I’m going to miss out. If not on the content (which I believe will be in debug), on the gameplay. 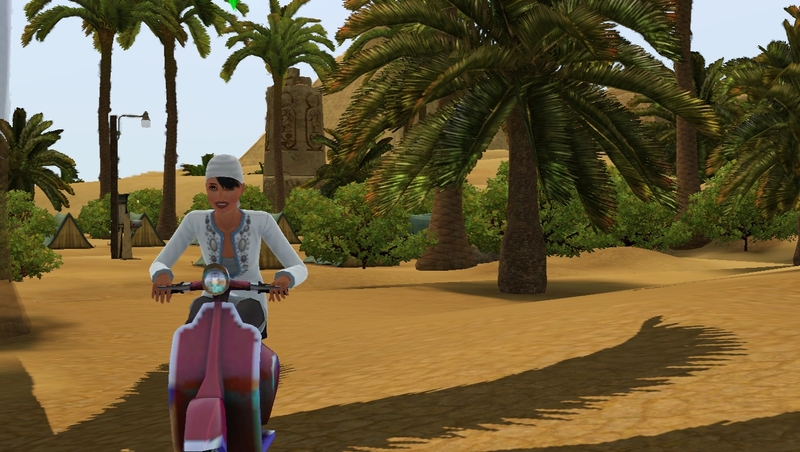 I’d be happier if they kept Jasmine in the game all year round, and just updated her with the new content each season. So, I’d leave her in the community garden with her growthfruit. Then next time there is a challenge, like Spooky Day, maybe she’d move location to a park and offer a trick or treat themed challenge as well. This way, the content and challenges remain in game for those of us who don’t play seasonally, or who are short on time while the challenges are on. And you still get the new content and holiday-themed challenges. UPDATE!!! This version of the Junk Mod is no longer updated. Please find the new version HERE. 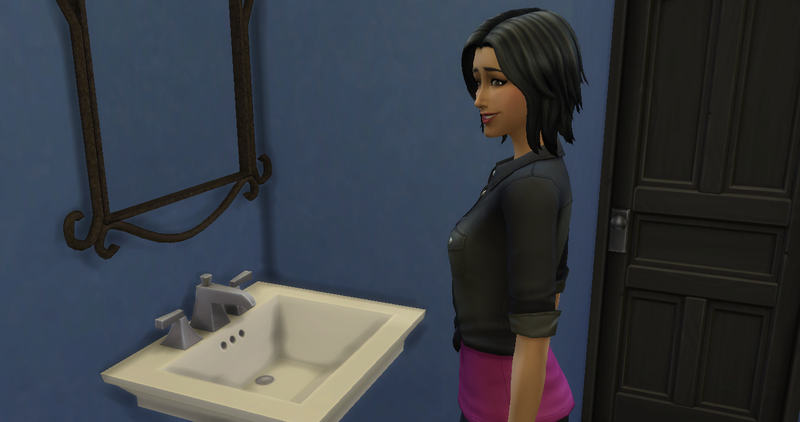 While playing with my Freegan household I really started to miss things like dumpster diving and picking up scrap objects from the junkyard. Since the Freegans aren’t really supposed to buy anything, I wanted them to be able to pick up items for free somehow. However, I didn’t want to make it too easy. 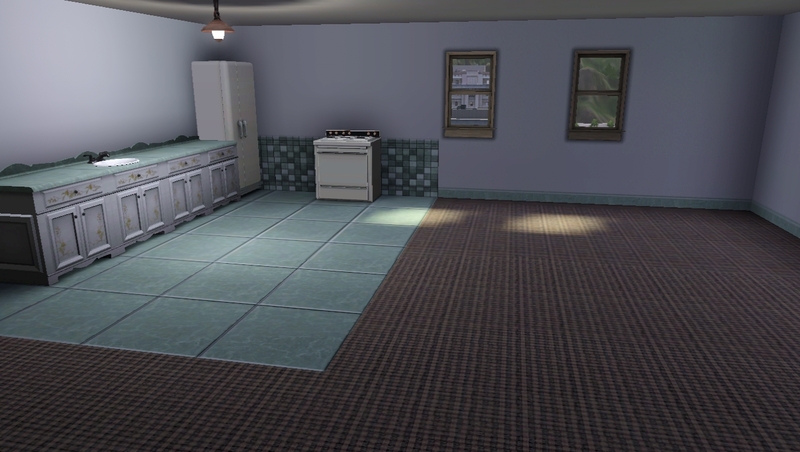 With this mod, you’ll get a junk pile object (found in the trash category, or search for ‘junk’). 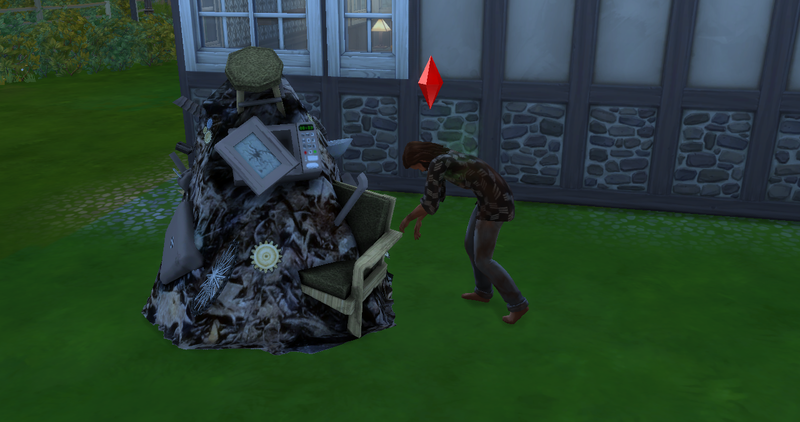 This is based on an outdoor trashcan, so sims can ‘scavenge’ in it as they would rummage for trash. 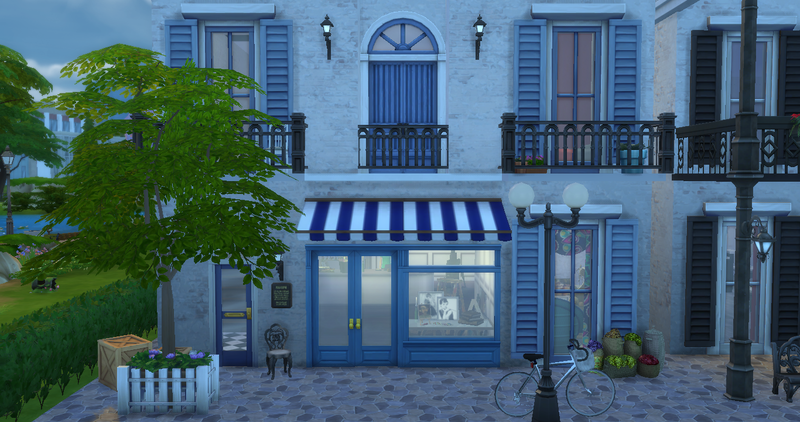 Only I’ve added a TON of extra items for your sim to find. 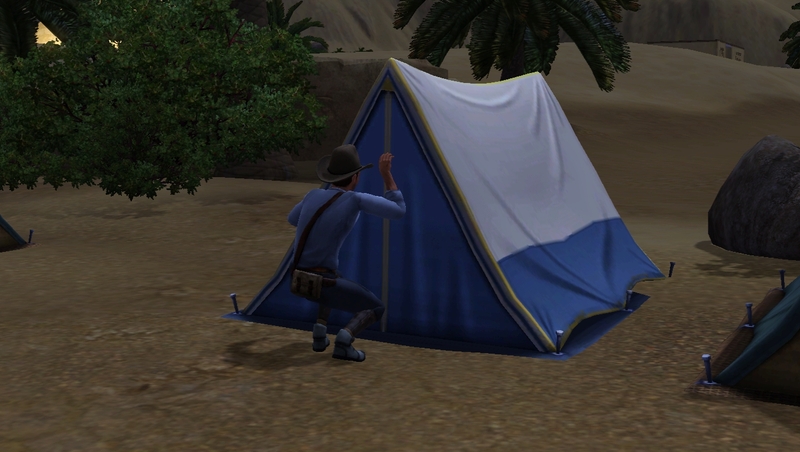 Previously they only gathered smaller items like postcards, and those items are still there, but now your sims can find a variety of useful items like yoga mats, tents and even a shower! !! !These packs are required for the mod to function correctly!!! 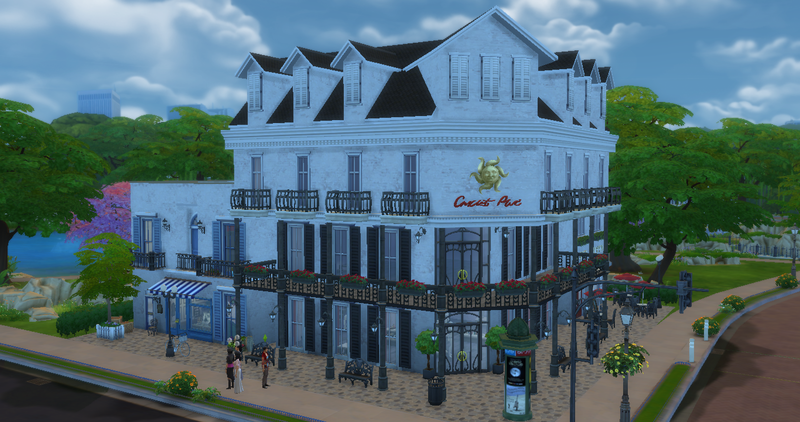 I’m calling this ‘version 1’ because I plan for this to be an ongoing project and I hope to add more items and upgrade options in the future. So, please let me know if you do have any issues and I’ll try to address them in the next version. 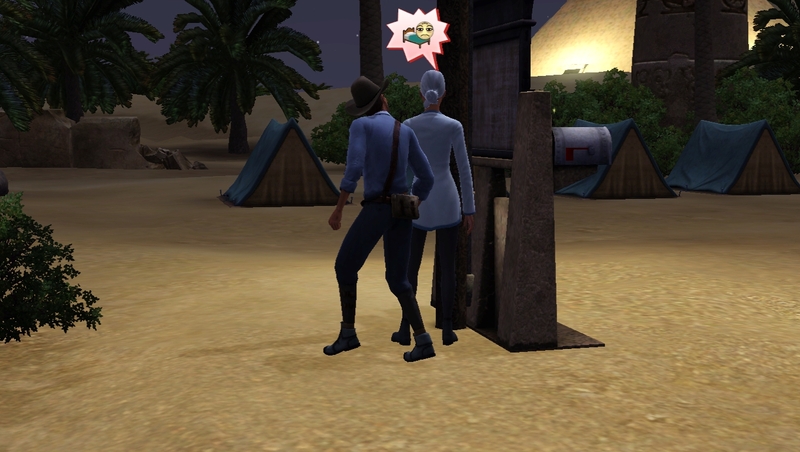 * You need to place it on a community lot to get the ‘scavenge’ interaction. 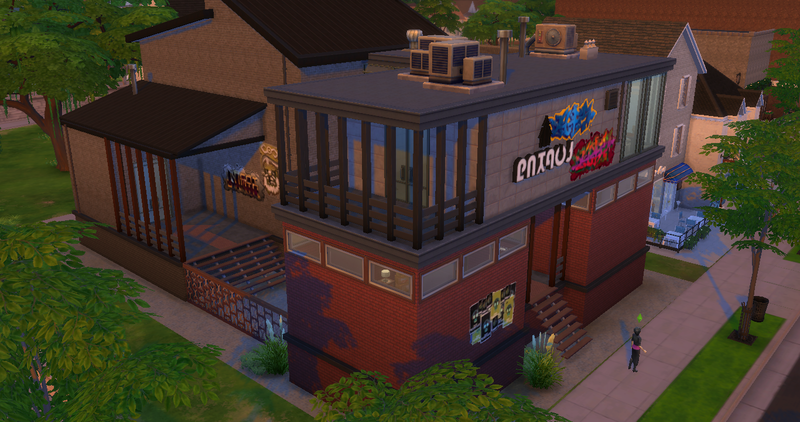 Round the back of a scruffy pub is a perfect place! * As its base tuning is a bin, it needs trash to be placed inside it for the ‘scavenge’ option to appear (you can’t junk-dive if there’s no junk!). 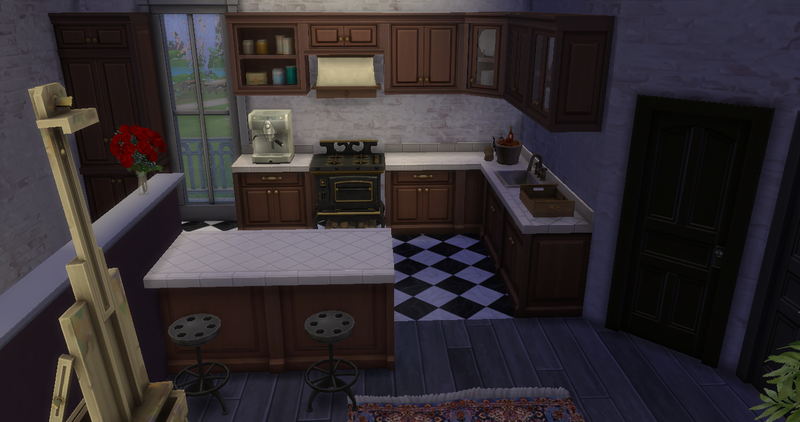 I left this as it was because I prefer the challenge of having to wait for another sim to refill it, so it’s not too cheaty. But when you scavenge the first time a pile of trash will appear, and you can just drop this straight back in and spam it if you like. Download Here! – Old Version! edit 18/06/2016: Please place the unzipped folder containing ALL the individual files in your Mods folder.